Building a poised but potent Ford small-block to swap into an early Mustang was the primary goal of this 428ci engine project. A couple of optional side duties were also factored into the early discussions, such as serving as an EngineLabs dyno mule for testing new hydraulic roller cams to higher-than-usual rev numbers. Durability, then, had to be a major consideration in addition to snappy street performance, intimidating appearance and reasonable cost. Those objectives then beg the question: What makes a great street engine? Black accented with natural alloy finish is the design target for this 428 Pony Jet project. This is how the engine looked just after final assembly. Before going to the dyno, however, the Edelbrock water pump and front cover and ATI damper were replaced to accommodate the Concept One serpentine pulley system. There’s no single correct answer as a million different responses will appropriately cover a wide spectrum of vehicle applications, owner needs and budget limitations. To narrow the focus there were a few required stipulations to set this project’s early direction. First, it had to be a traditional Ford small-block, since the engine would eventually end up under the hood of a ’65 Mustang fastback. Desired qualities included an assertive idle followed with cordial street manners, color coordination to match the car’s black-on-black theme, low maintenance and plenty of reliable parts that could take an occasional healthy dose of nitrous. That led to stroking a 351 Windsor platform. With that mantra as inspiration, project 428 Pony Jet was conceived, symbolizing the engine’s displacement and a pun reference to the milestone 428 Cobra Jet fused with the engine’s eventual installation in the original ponycar. A power objective is also a good starting point in the planning process. 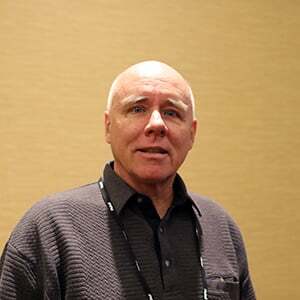 The late, great engine guru John Lingenfelter was a strong champion for delivering torque and power where the engine will spend most of its time running. To that end, he advocated a basic target of 1.1 horsepower and peak torque per cubic inch for a well-balanced street engine running on pump gas. A quick calculation reveals that this engine needs to deliver at least 470 horsepower with peak torque of 470 lb-ft. Given that Lingenfelter suggested that formula in the mid-’90s, adjusting for inflation up to 1.2 horsepower/torque seems appropriate for today, especially considering a number of automakers now offer naturally aspirated production engines with 500-plus horsepower. The new power objective, then, is at least 513 horsepower and 513 lb-ft peak torque within a reasonable street-worthy rpm range. It’s also a good idea to have a benchmark when planning out a street engine, not only to set performance objectives but also keep the costs in line. What’s already available? What’s the competition like? No sense spending $15,000 to piece parts together if what you need is available for $10,000 ready to run. 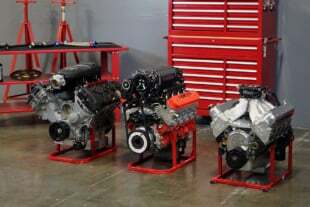 Ford Racing Performance Parts offers a 427ci long-block crate engine with a 10.5:1 compression ratio rated at 535 horsepower, and the street price is around $9,500. But that doesn’t include ignition, induction or accessory drive. Tack on another $3,000 or $4,000 to get it ready for installation. Mopar Performance has a Gen III 426 Hemi crate engine rated at 540 horsepower with 530 lb-ft torque. It features an aluminum block and EFI but doesn’t come with an ECU or accessory drive. Cost is around $13,000. 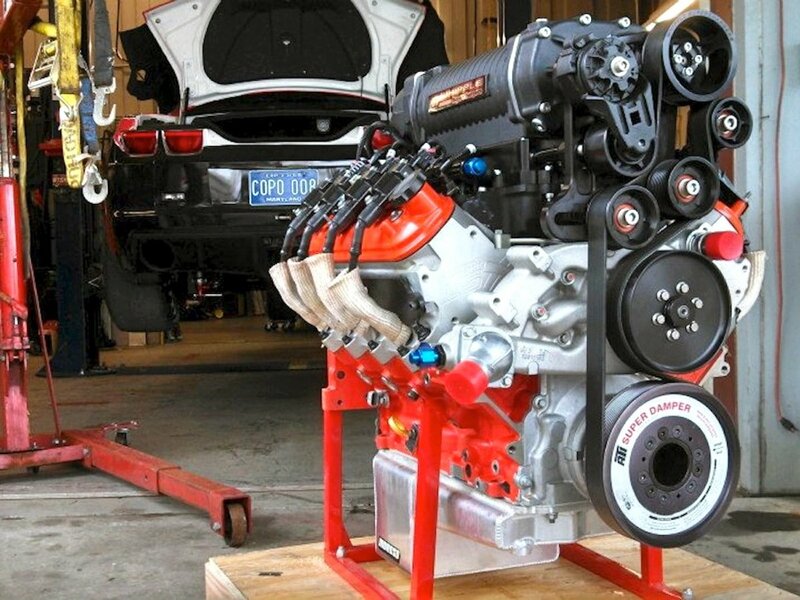 Finally, there’s the 427ci LS7 crate engine from Chevy Performance. That EFI all-alloy motor costs about around $13,500 and is rated at 505 horsepower with 470 lb-ft of peak torque. It also needs an ECU and front drive. 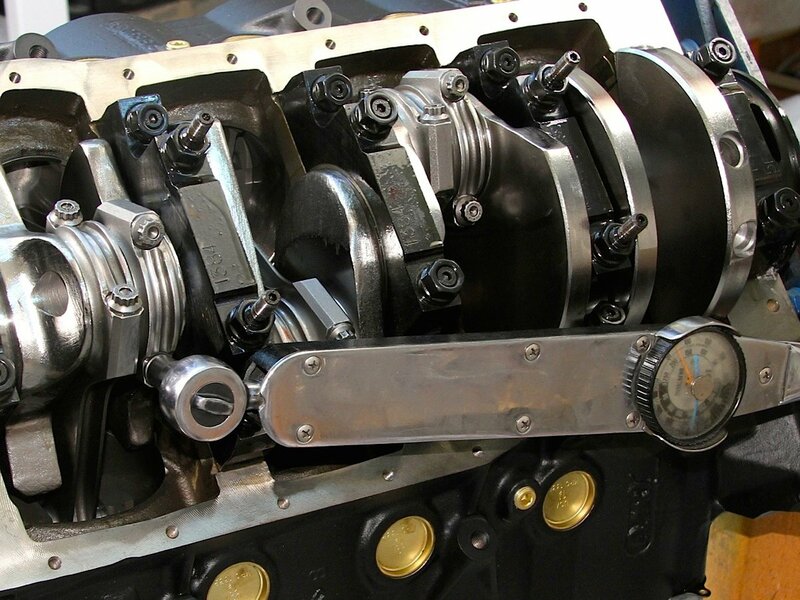 The single common denominator between all three of the above engines is a 4.125 bore matched with a 4.000-stroke crank — same dimensions planned for this engine project. The math computes those factors to a 427.65 cubic-inch displacement. Some round the number up, some round down to identify with historical engines within a particular brand. We’re going with 428. One could argue all day which engine delivers the most bang for the buck. The talking point taken away from this discussion, however, is that we need to build a big-cube small-block for around $13,000 that easily delivers over 500 horsepower and 500 lb-ft of peak torque. It should be ready to run, have some high-revving flexibility and — this is important — match the durability built into factory crate-engine programs. A 200-shot of nitrous led to a top dyno run of 750 horsepower, but a robust flat torque curve is the engine’s strong point. A 428ci Windsor foundation is popular enough to generate a large selection of suitable aftermarket parts that will meet EngineLabs’ performance and durability targets, including forged internals, proven cylinder head design, a variety of valvetrain options and flexible induction opportunities. Working with a number of leading companies resulted in the parts lists noted in the accompanying short-block and induction/ignition sidebars. Using street prices found online, total cost for these components came to about $14,500. 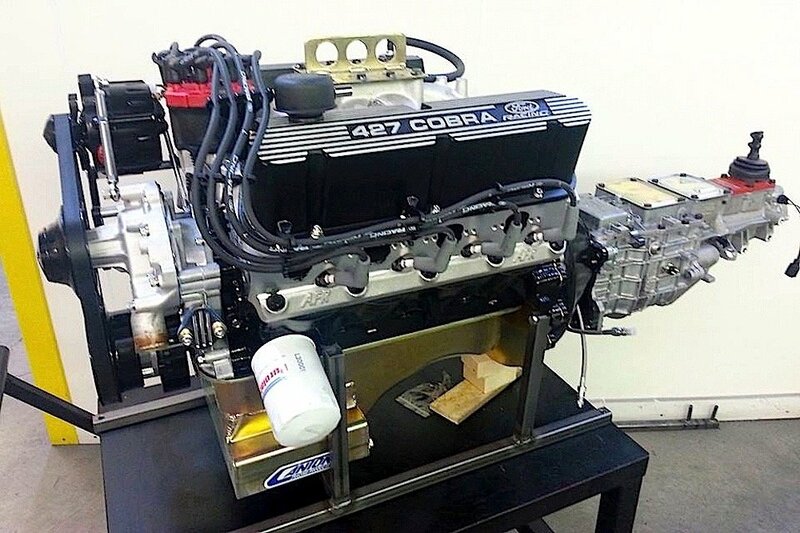 Take off the direct-port nitrous system and 428PJ would have a been in the same ballpark as the crate engines mentioned earlier. And this engine is ready to run. All it needs is a source of fuel, some plumbing and a flywheel — this price includes accessory drive, water pump, spark-plug wires, alternator and even the starter. But did 428PJ meet its performance goals? 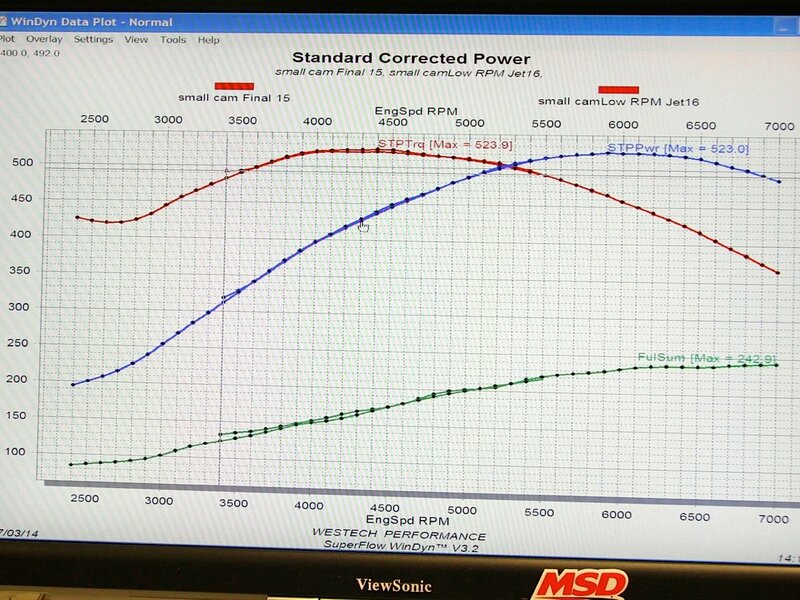 Working with Crane Cams and Quick Fuel Technology, two cam/carb setups were tested on the dyno at Westech Performance. The hotter cam and 1,000 cfm carb went first, resulting in 537.7 horsepower at 6,300 rpm and 513 lb-ft torque at 4,800 rpm. 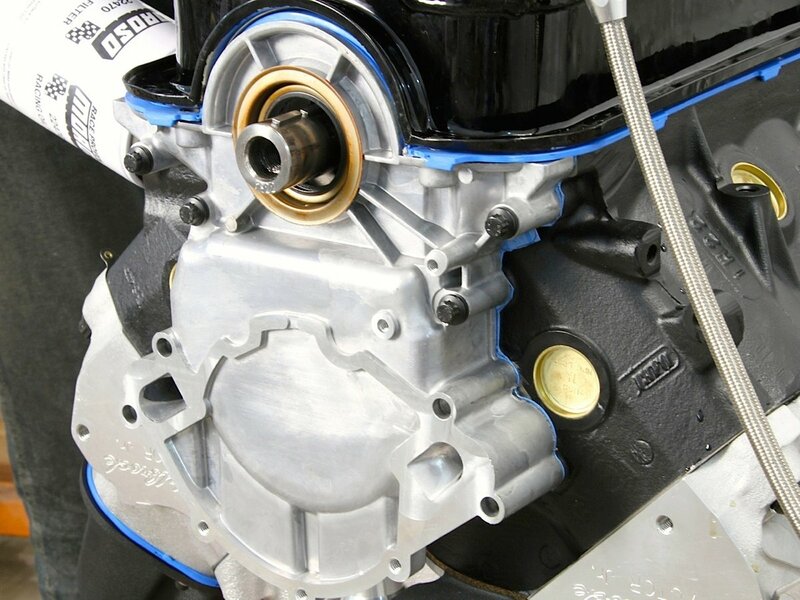 The smaller cam and 850 cfm carb followed with a best of 523 horsepower at 5,900 rpm and a stronger low-end torque curve of 523.9 lb-ft at 4,400 rpm — all on 91 octane pump gas. For the final test with the small cam/carb street setup, 118-octane fuel and a 200-shot of nitrous were sprayed into the ports at 5,000 rpm, producing a healthy 750.3 horsepower at 5,900 rpm and 700.1 lb-ft at 5,400 rpm. From a durability standpoint, the engine has signs of overkill, but no one’s complaining about those decisions. “Yeah, this setup is overkill for a street engine,” quips Jason Thompson of Cloyes Gear, the manufacturer of the billet timing set used in the engine. Yeah, but the GM LS7 crate engine has titanium connecting rods; so, talk about overkill! Still, it was a fun project that produced a reliable high-performance street engine with solid dyno numbers and a clean, bold appearance. Follow along with the build for more insight into the parts selection and dyno runs. Since a forged rotating assembly was planned from the start, it didn’t make much sense to anchor those premium components in a used factory block that may have hidden durability issues. 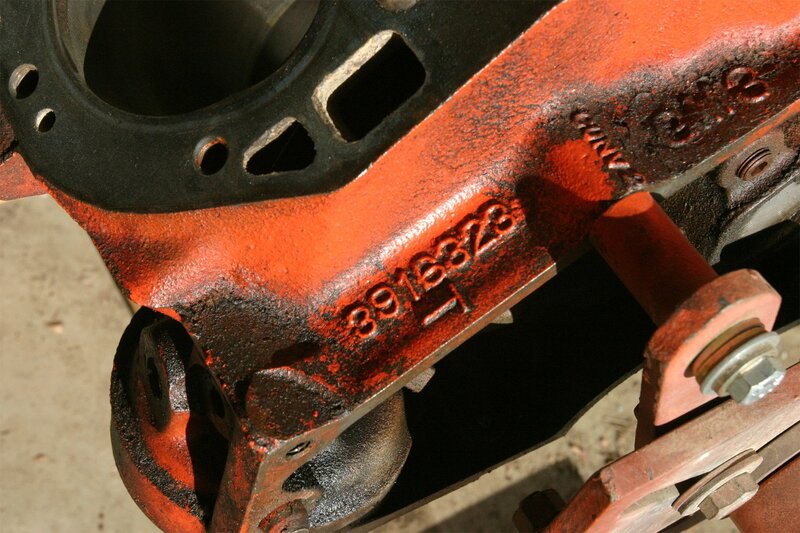 A more appropriate choice is the Dart SHP 351 cast-iron block with a 4.125 bore. It comes with Cleveland-sized 2.750-inch main journals, priority main oiling and extra-thick cylinder walls that can be bored to 4.185. Other features include splayed 4-bolt main caps on the inner locations, 1/2-inch blind head-bolt holes and 1-piece rear seal. Stroker John had very little prep work beyond finish honing the cylinder bores, installing freeze plugs and oil-galley plugs, chasing all the threaded holes and painting it satin black. The Dart SHP block supports most standard 351W parts, except that the main journals are Cleveland sized at 2.750-inch diameter. This block came with a 4.125 bore that needed only finish honing. The mains were centered and line honed, and it came with all the necessary cam bearings and hardware. The block needed only routine prep work before assembly. The lifter bores are delivered on the tight side, so a quick hone brought them out to spec, and all threads where chased for accurate torque readings and easy plumbing chores. There was some minimal burr removal in select areas before the Dart-supplied coated cam bearings were installed along with the oil galley plugs/restrictors, freeze plugs and rear cam plug. One helpful feature of the steel caps is a small notch at the base to facilitate removal with a small pry bar. This trick is especially helpful during pre-assembly and clearance checks. While the Dart block will support a stroke up to 4.250-inch, an Eagle 4-inch crank forged from 4340 chromoly steel fit the 428PJ goals perfectly. It has standard oiling and SBC-sized 2.100-inch rod journals. The 4.00-inch stroke Eagle crankshaft is forged from 4340 chromoly steel, designed for internal balance and features a standard oiling pattern. It’s good for up to 1,500 horsepower and weighs around 58 pounds. 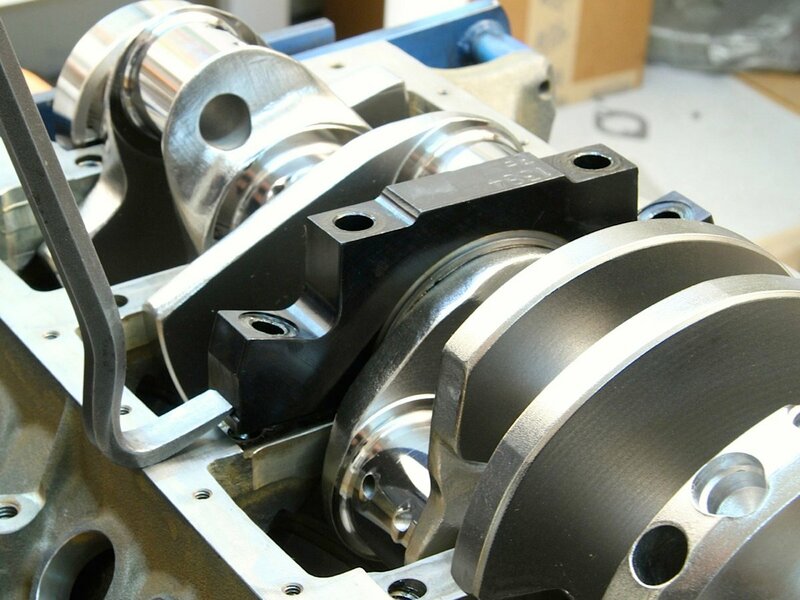 This crank was ordered with Eagle’s unique mirror-like ESP Armor treatment, which adds a few horsepower by smoothing the surface to help the counterweights shed oil and keep temperatures down. The Eagle crankshaft was checked and the appropriate Clevite bearings were sourced. Rod journals are Chevy sized at 2.100-inch diameter. Note the counterweight grinds for internal balance. Other construction features include .125 fillet radius that helps add rigidity, and journal surfaces are polished to a 2 RA or better finish. 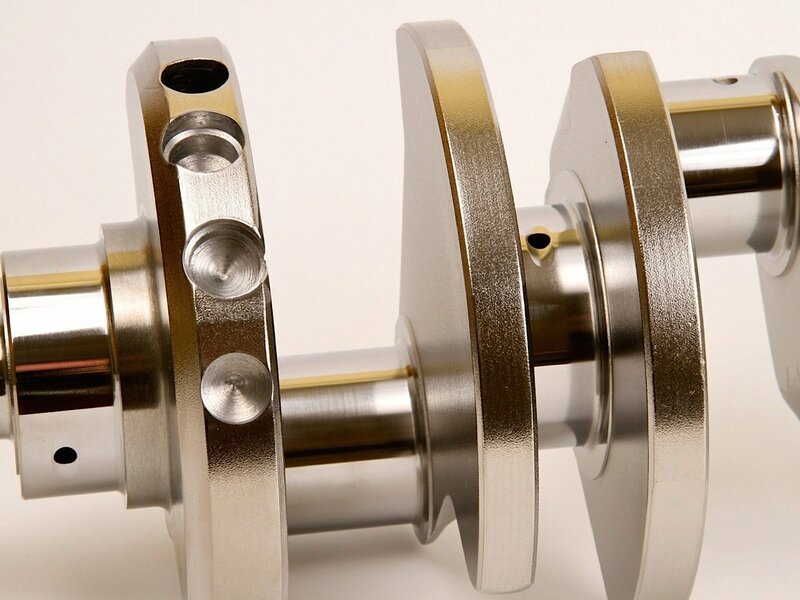 The crankshaft is also designed for internal balancing without the need for additional heavy metal. All engine hardware was sourced from ARP, including a main-stud kit that is constructed from 8740 chromoly with a 200,000 psi tensile-strength rating. 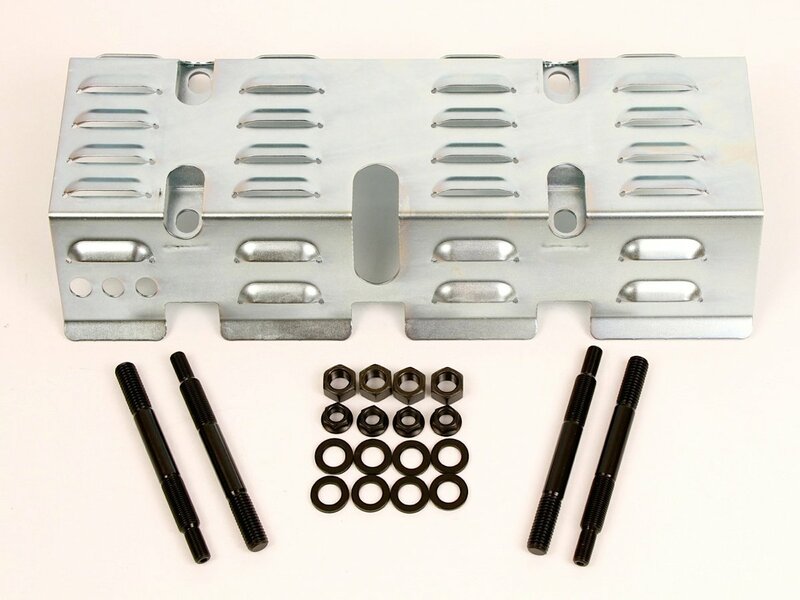 Other fasteners include a head-stud kit and the accessory kit that provides bolts and washers for the valve covers, oil pan and other engine components. Taking the guesswork out of gathering up a rotating assembly, Eagle offers a full stroker kit for the Windsor that provides forged rods and Mahle pistons — including the 4.125 x 4.000 combination needed for 428ci. However, Eagle didn’t have the piston dish required to keep the compression ratio in the desired 10.7:1 range. So Mahle was queried about a piston with a -20cc dish and correct 1.245-inch compression height to work with the Eagle 6.250-inch H-beam rods that are also forged from 4340 steel and come with 7/16 ARP 2000 fasteners. Fortunately Mahle had such part number tucked away in its inventory. While those pistons were being packed and shipped, the necessary weight information was sent to Eagle so that the crank could be balanced. For the record: piston, 420.1 grams; pin, 116.8 grams; clips, 2 grams; and ring pack, 36 grams. Extra long studs are needed at four positions to secure the Moroso windage tray. Those studs were provided by Moroso and treated to ARP Ultra-Torque to ensure a clean reading from the torque wrench. The inside nuts were tightened down to 105 ft-lb while the outside nuts were tightened to 65 ft-lb, as recommended by Dart. Note the black paint on the block and standard Ford-sized freeze plugs along with the standard 1-piece rear seal. Finally, the Eagle added its proprietary ESP Armor surface finish to the crankshaft to improve durability and the mirror-like finish helps shed oil quicker. Eagle stresses that ESP Armor is not a coating that can flake or chip off, nor does the process remove any measurable material. Adding to the durability goals of 428PJ, Eagle includes a one-year warranty against failure of any kind in any application when its forged-steel cranks are sold with the ESP Armor treatment. “We believe this to be the only warranty available on any aftermarket crankshaft, regardless of price,” adds Davis. 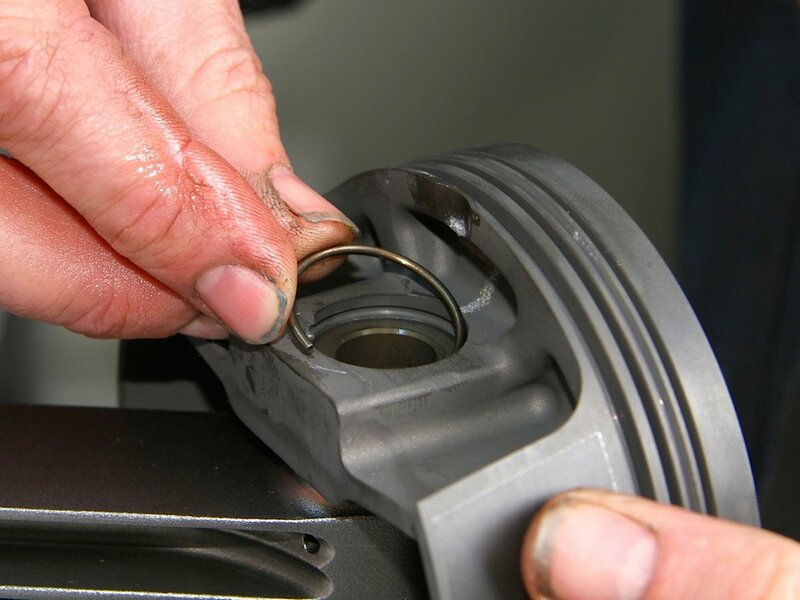 The Mahle Motorsport Power Pak pistons are forged from 4032 aluminum — which offers better wear characteristics over a 2618 alloy — and feature a grafal anti-friction coating on the skirts that’s designed to last 100,000 miles. Ring sizes are 1.5, 1.5 and 3.0mm. The pistons are also phosphate coated to reduce the chances of the rings micro welding or the pins galling. Other features include CNC-machined pin bores for the .937-inch diameter steel pins and dedicated machining to ensure flat ring grooves. 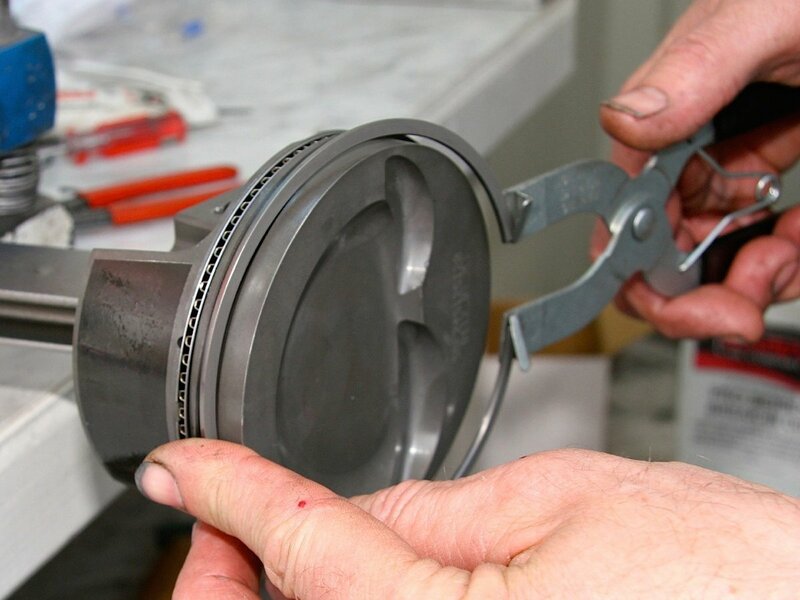 The pistons were wrapped with Total Seal AP (advanced profiling) ring sets that includes a tight-tolerance steel top ring. While many rings are ground in the manufacturing process, Total Seal laps its ring to an axial spec of +/- .00015-inch, compared to other rings that can be +/- .0005-inch. Crane sent two cams for dyno testing. Each are manufactured from carburized 8620 alloy billet steel cores, which resists spalling or particle flaking than on 5150 or other cam cores. 8620 is also more ductile with much less chance of breaking like more brittle cores. The Crane hydraulic roller lifters come in the standard .874 diameter. They’re CNC machined for a precision fit and feature anti-rotation guide bars. The big cam was installed following a generous application of Driven assembly grease, then secured with a standard retainer plate. 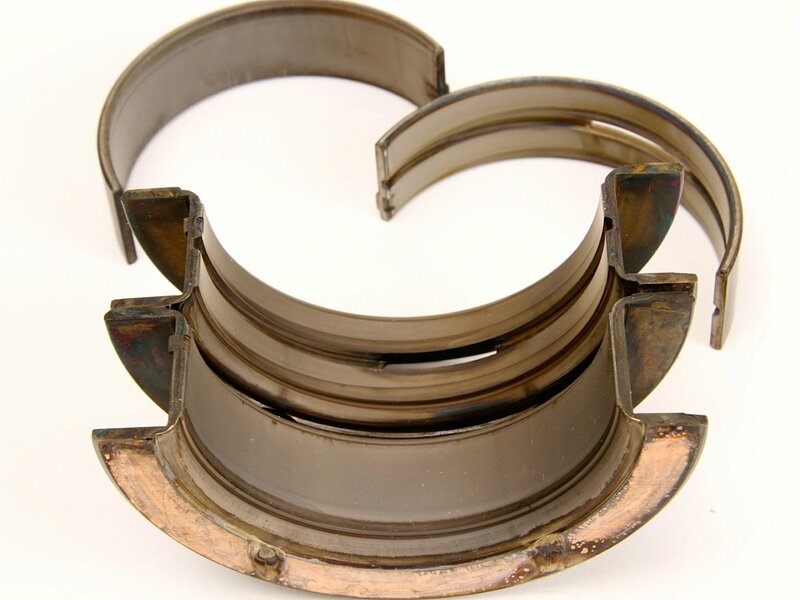 The second ring is an iron napier style, which aids in re-directing the oil back down the cylinder wall, which is particularly helpful with modern low-tension oil rings. The oil rings are a 3-piece flex-vent style which help return oil through the drain quicker. 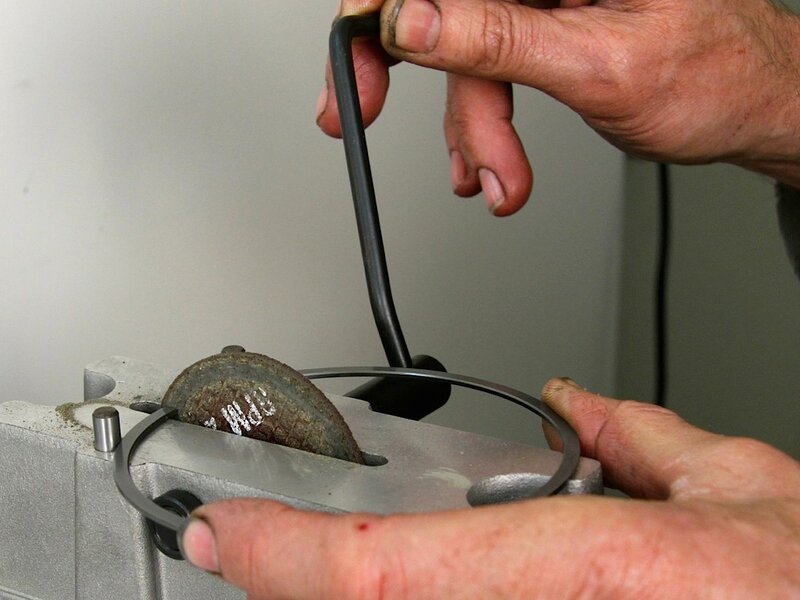 Total Seal rates these oil rings at 13 to 14 pounds, which is slightly higher than a typical 3.0mm at 10 pounds. Both sprockets in the Cloyes timing are machined from induction-hardened billet steel and hand matched for a precise fit. 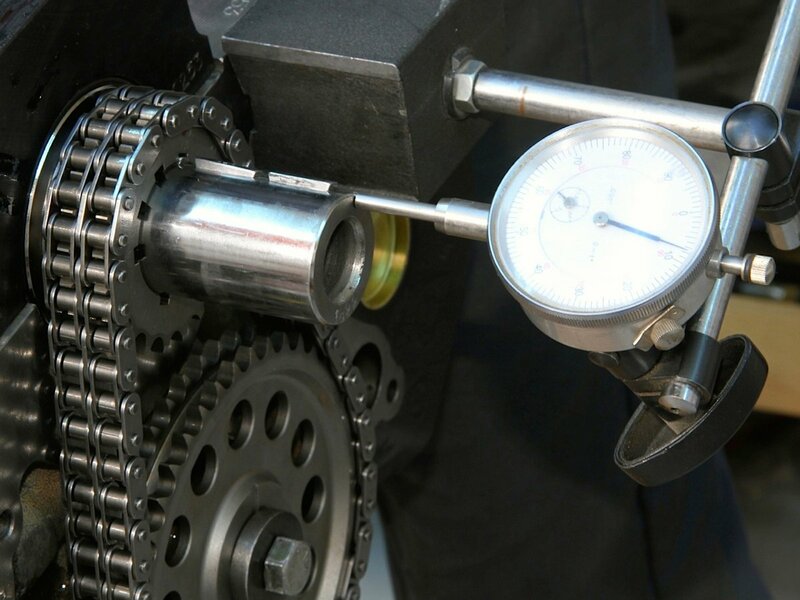 The Z-Racing roller chain features .250-inch diameter rollers. 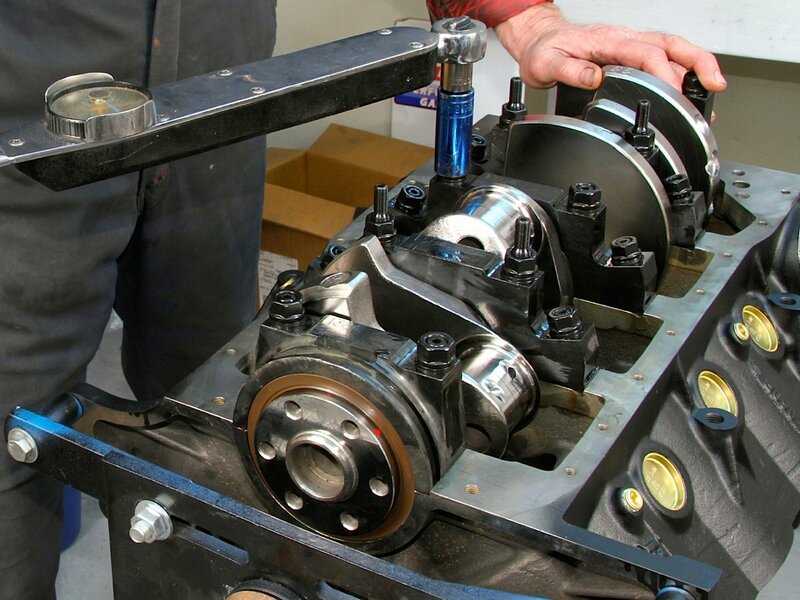 When the timing set was installed, crankshaft and camshaft endplay were rechecked. 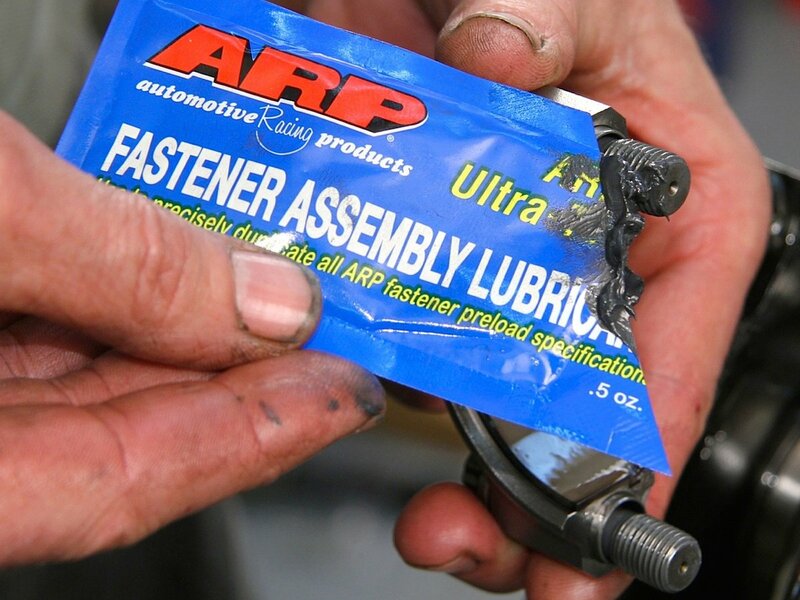 Stroker John used Driven engine-assembly lubricants and ARP Ultra-Torque when assembling the short-block. He also upgraded to ARP 1/2-inch main studs (7/16 outer on the 4-bolt mains). These black-oxide finished studs are constructed from 8740 chromoly steel, come with 12-point chromoly nuts and are rated to 200,000 psi. As mentioned earlier, Crane supplied two cams for comparison. The test strategy was to test the more aggressive cam first, then swap to the milder cam since the engine would then be prepped for street duty. Both cams are custom-ground, dual-pattern hydraulic rollers. The lobe grinds were determined after analyzing the displacement, compression ratio, induction choices and head flow. 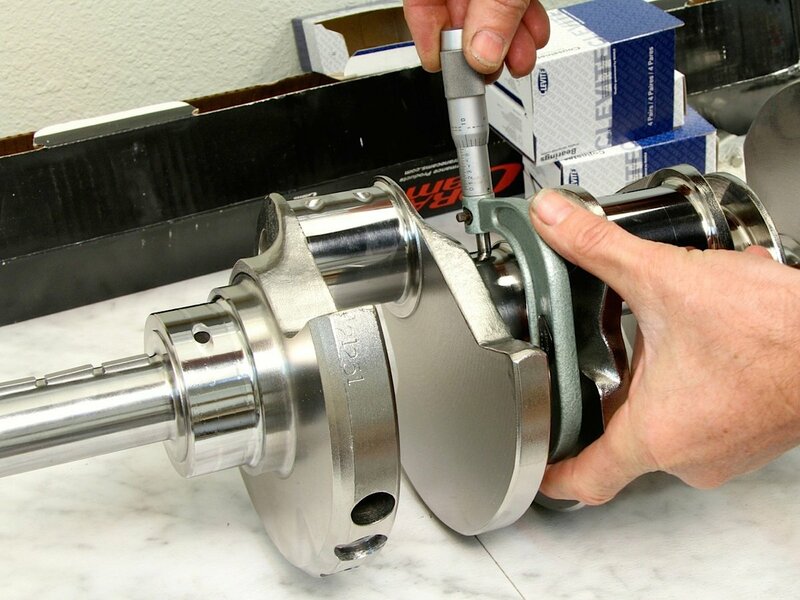 The reciprocating assembly includes Eagle 6.250-inch connecting rods, Mahle pistons (-20cc dish) and pins, Total Seal rings and Clevite rod bearings. The Mahle piston pins are secured to the Eagle rods with wire locks. Ring gap was set at .020-inch before the Total Seal rings were installed. Crane roller cams are manufactured from carburized 8260 alloy steel-billet cores, which are more ductile and less likely to “snap” than traditional 5150 alloys that are more brittle. 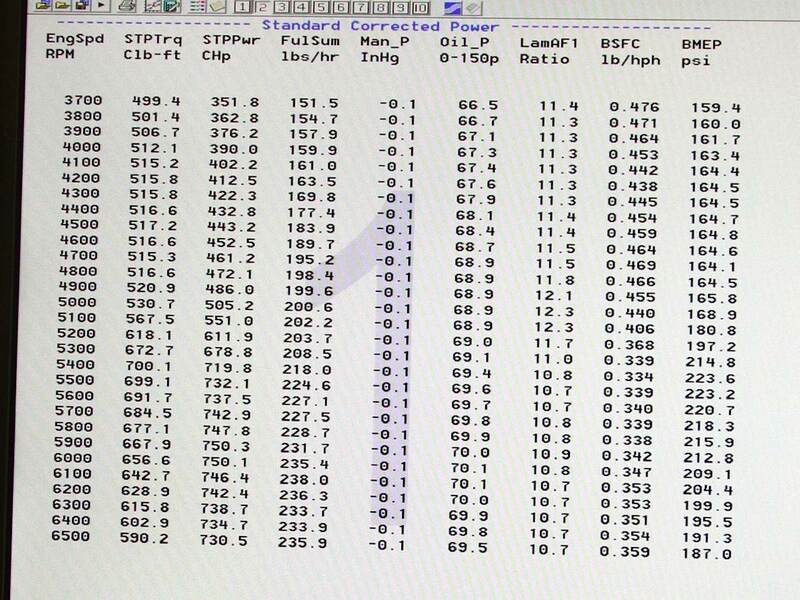 The more aggressive cam was spec’d at 260/268 @ .050 with a final valve lift of .680 using 1.7:1 rockers. The smaller cam was spec’d at 244/252 @ .050 with a a .640 valve lift using 1.6:1 rockers. Both cams featured 110-degree lobe separation. Top row: Installation of the piston-rod assembly was effortless with a dedicated ring compressor. The cylinder bores and piston skirts were treated to Driven HVL. 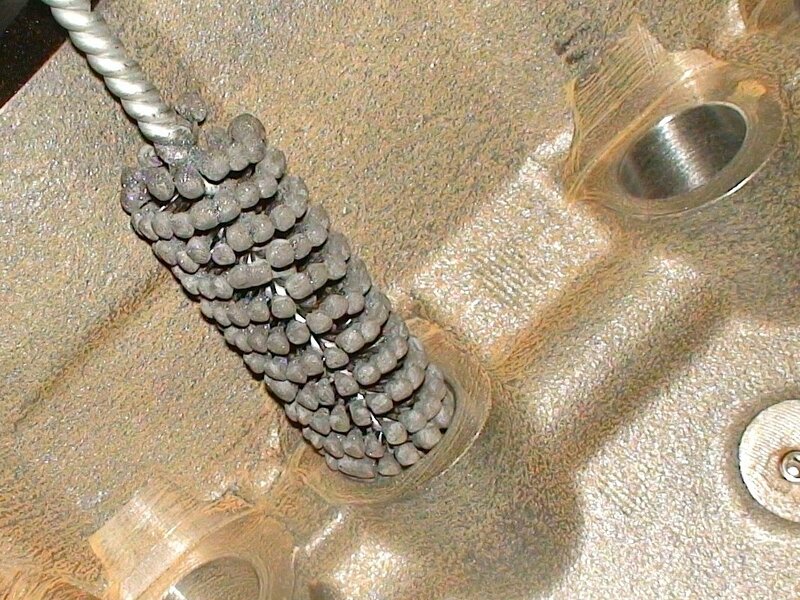 Bottom row: The rod bolts were tightened to 75 ft-lb following a dab of ARP Ultra Torque. The cams were installed with a Cloyes billet True Roller timing set. 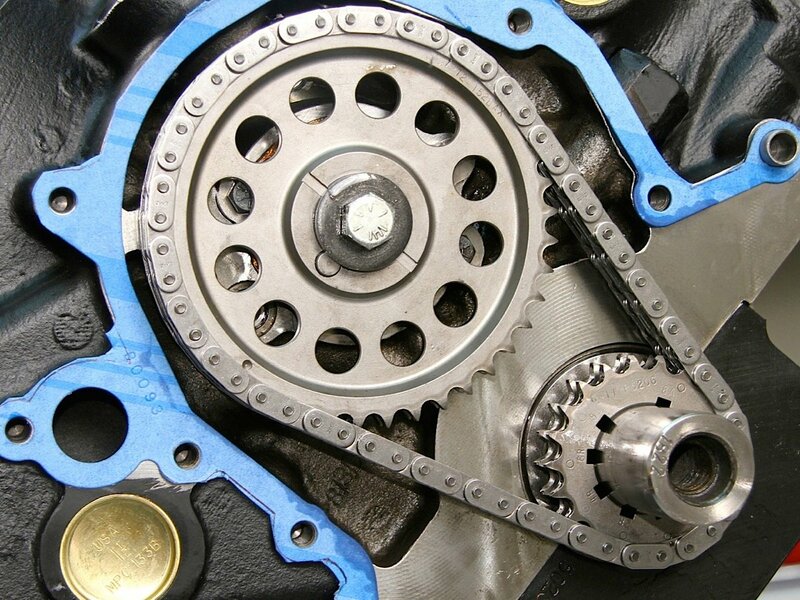 Each sprocket is CNC-machined from billet steel and induction hardened. The set includes a premium Z-Racing series double-roller chain that features side plates cut from high-strength steel and heat treated to reduce stress risers and minimizing fractures under high loads. The .250 rollers are also cold-rolled and hardened. With the pistons in place, TDC was determined and the cam timing checked. 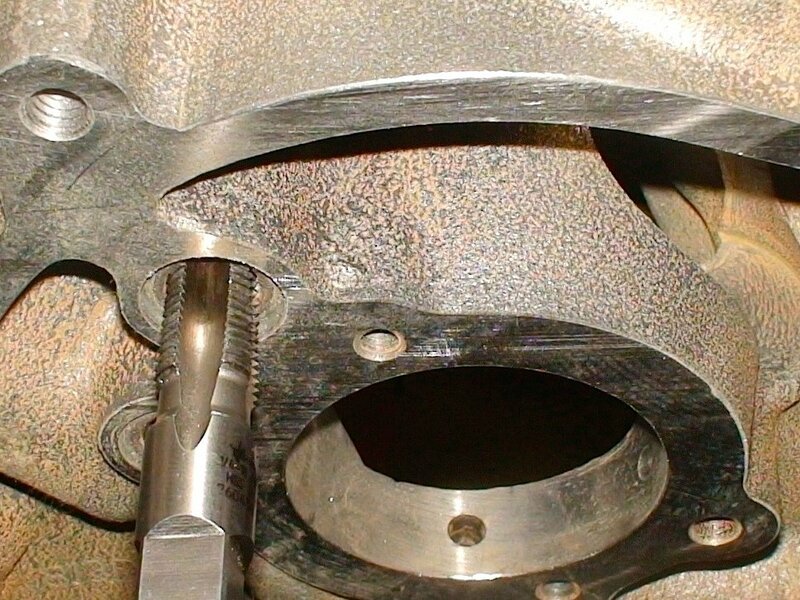 Stroker John noticed a late opening of the intake when the numbers were checked against the cam card, so the Cloyes crank sprocket was adjusted to reflect a 2-degree advance. 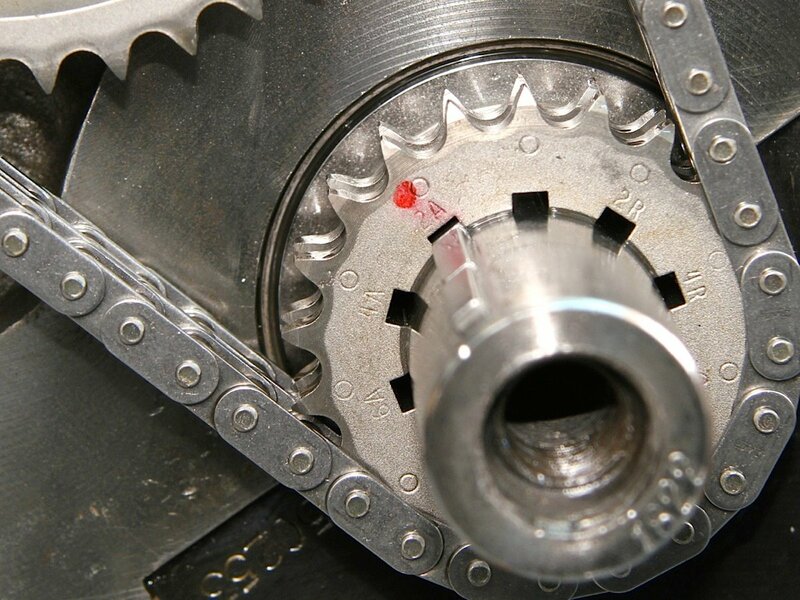 The crank sprocket can be ordered with either a 3- or 9-key option to advance or retard the cam timing without the fuss of bushings or other time-consuming methods. 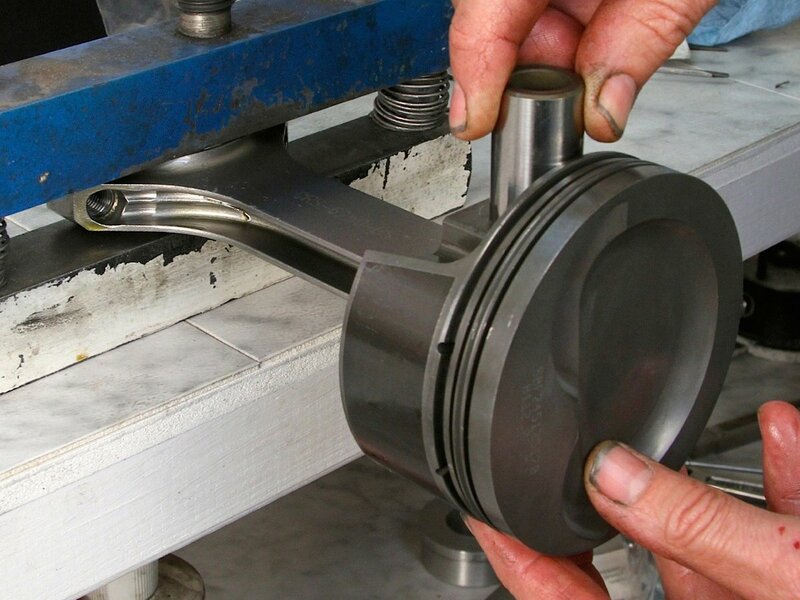 All billet timing sets are hand matched to ensure center-to-center distance and runout. Finishing up the bottom end are a Melling high-volume oil pump, which is driven by an ARP driveshaft, and Moroso oil pan. Moroso spec’d out a 9-quart road-racing pan over its 7-quart offering and also suggested a louvered windage tray to allow oil thrown from the rotating assembly to drain back into the pan sump and not splash back up into the crank and rods. 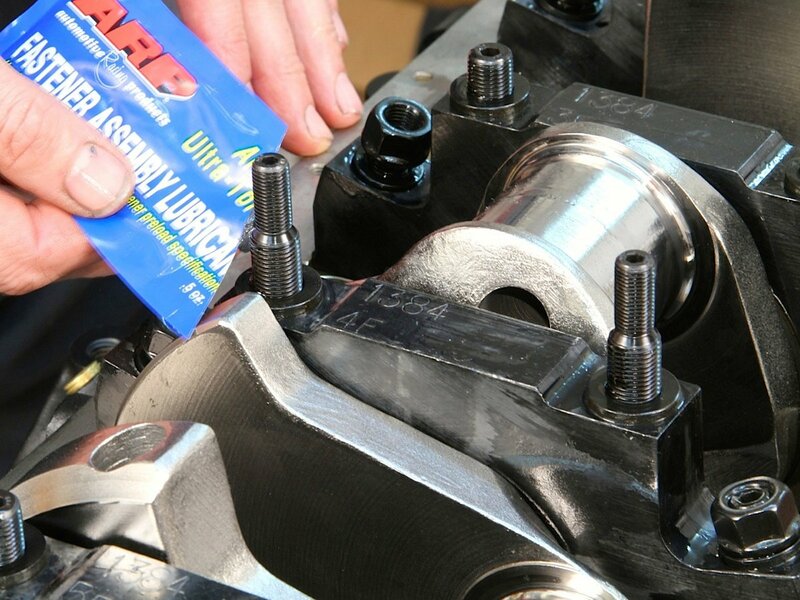 Supporting the lubrication system is a Moroso 9-quart oil pan that is black powdercoated. The pan is designed for road racing and features a set of trap doors and baffles to reduce the chance of oil sloshing around and leaving the pickup dry, especially under high G-loads when the car is in the corners. Stroker John also added a Moroso windage tray to help keep oil off the crank. The 8-inch-deep oil pan is designed for Ford vehicles that use a front sump, such as the early Mustang, and features a internal baffling for road racing as well as drag-strip use. This pan will clear blocks with 4-bolt center mains, but not aftermarket blocks with 4-bolt front and rear mains. That works perfect with our Dart block. The pan was also fitted with Moroso’s flexible stainless-steel dipstick assembly, and the engine was treated to a Moroso oil filter for the dyno test. Finally, Moroso requires a specific pickup to work with this pan and the Melling pump. A specific Moroso pickup is needed to work with the Melling high-volume oil pump, which is turned by an ARP driveshaft. Part of the pickup brace had to be cut away to clear the windage tray. Given the 9-quart capacity, Schroeder was asked about filling it up with just seven quarts to save a few bucks on trips to the lube center. All of the Dart head-bolt holes are blind, so thread sealer is not needed on the ARP head studs, which feature a female hex drive for easy threading into the block. Caution: Do not overtighten the studs. 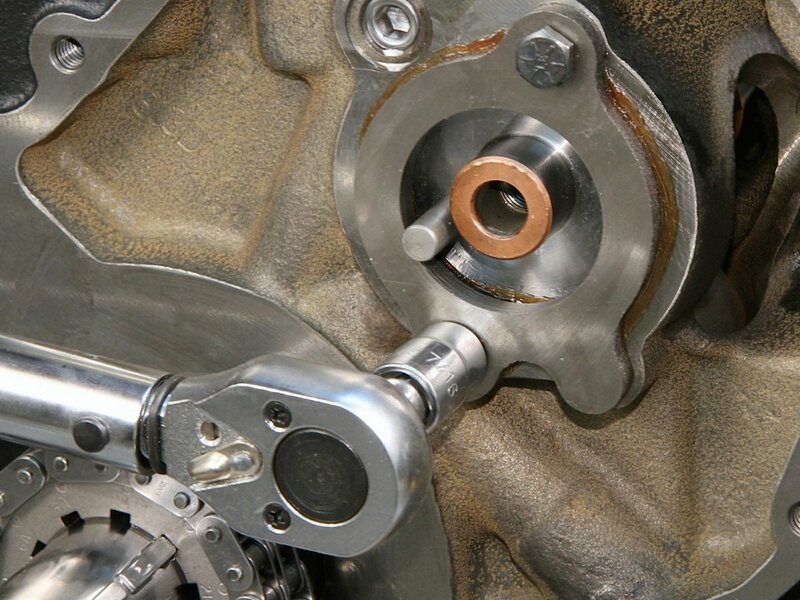 Some engine builders will apply a thread locker if they service the head frequently to help keep the studs from backing out when untightening the nuts. Note the longer studs are positioned closest to the valley and the shorter studs are on the bottom of the deck. 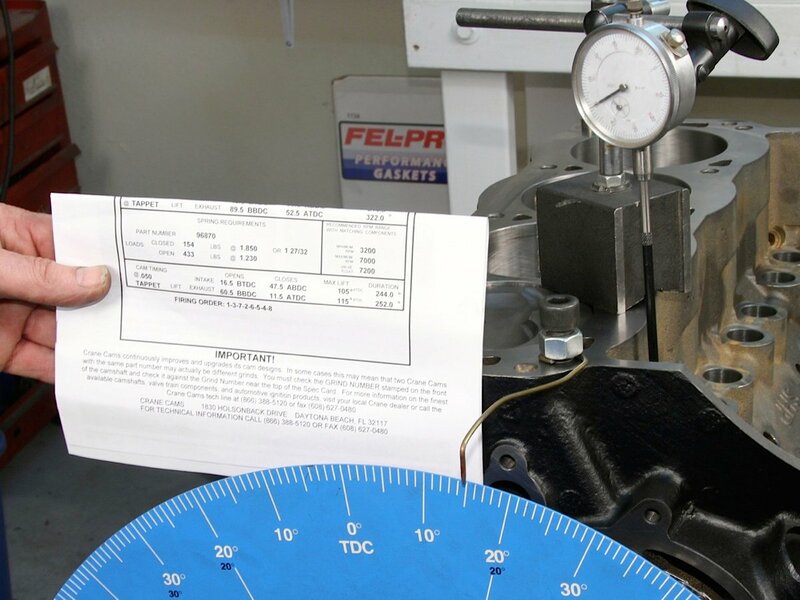 The Fel-Pro PermaTorque multi-layer-steel head gasket has a .041-inch compressed thickness. The pan was installed with ARP fasteners and a Fel-Pro molded rubber gasket. Detailed information on the Fel-Pro gasket kit and assembly tips can be found in this previous story. 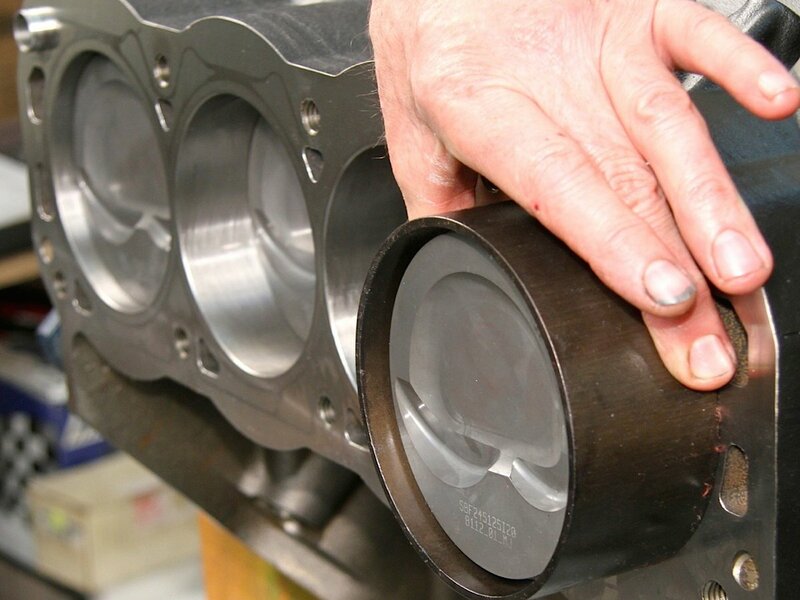 The kit includes Fel-Pro’s unique 4-layer PermaTorque MLS stainless-steel head gaskets to seal the Edelbrock Victor Jr. cylinder heads. 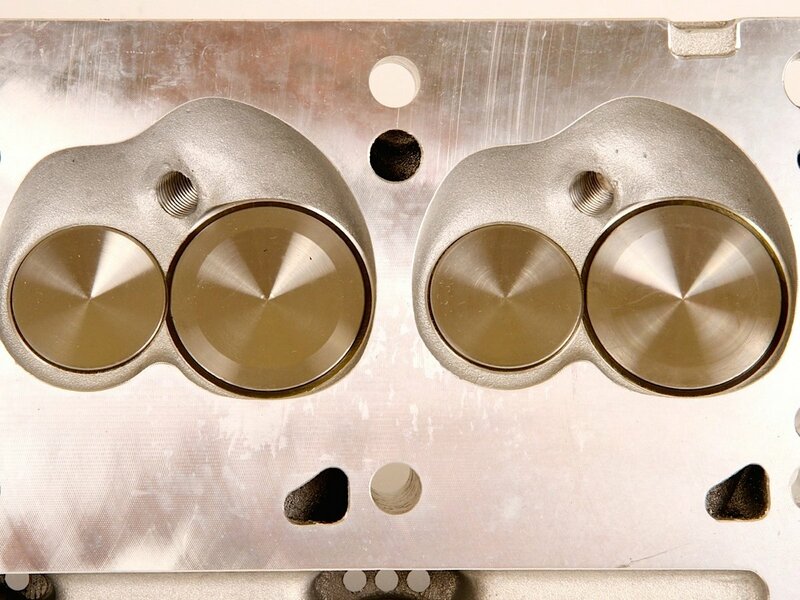 These cylinder heads feature 60cc combustion chambers, 210cc intake runner volume and 75cc exhaust port volume. 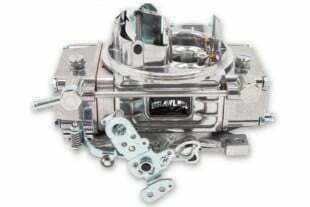 They can be ordered bare or fully assembled with manganese bronze valve guides, 7/16 rocker studs, hardened steel guide plates, performance valve springs and 2.05/1.60 Ferrea 6000 Series valves, which are forged from EV8 stainless steel. The valves are also heat treated and stress relieved, and the stems are hard chromed. 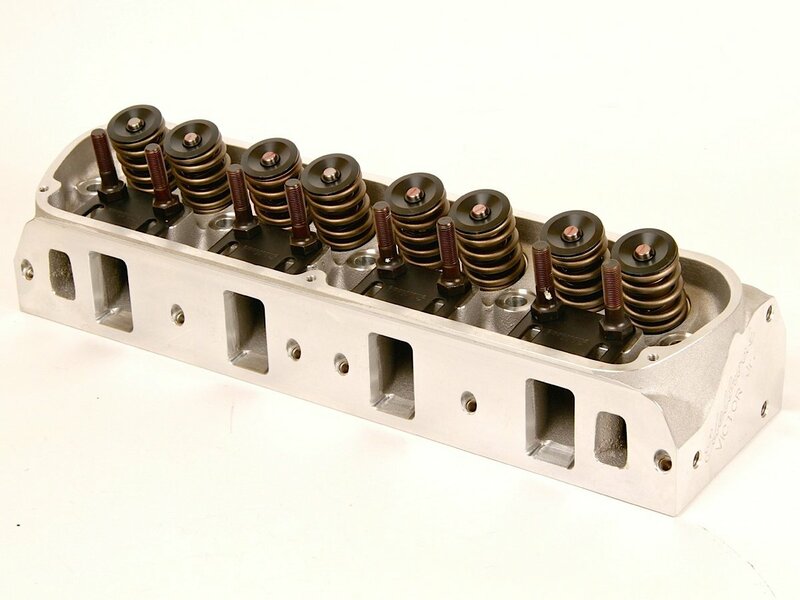 The Edelbrock Victor Jr. 20-degree cylinder heads feature 60cc combustion chambers and can be ordered fully assembled with Ferrea 6000 Series 2.05/1.60 stainless-steel valves and hardened steel guideplates. 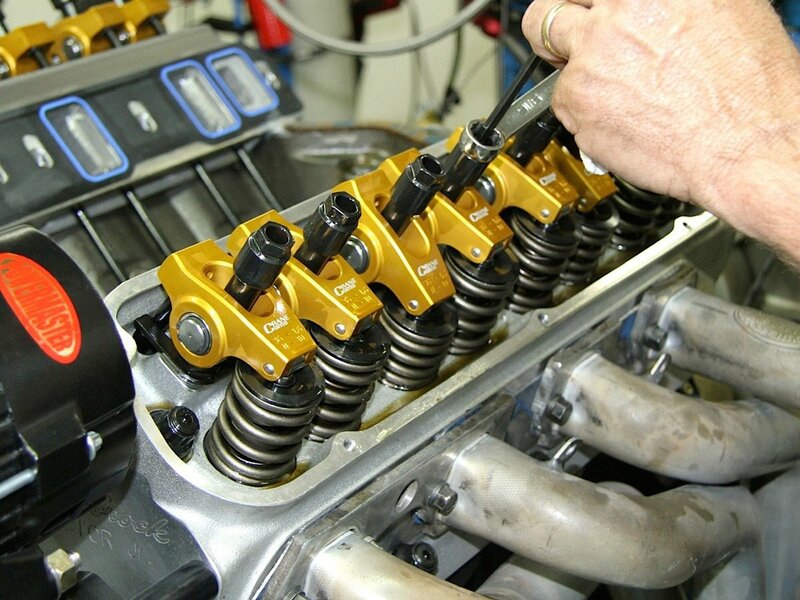 There’s also a choice of valve springs to suit either hydraulic or solid cams. 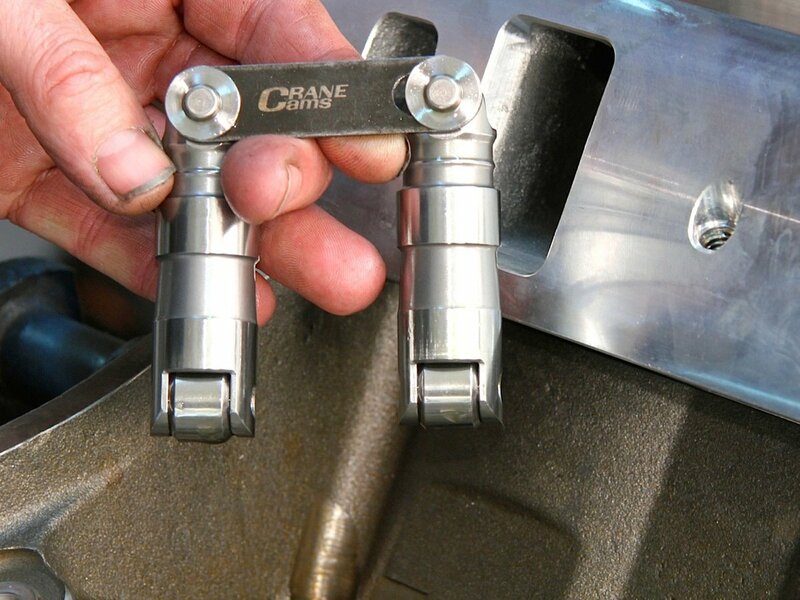 These heads came the former choice that have a 145-pound seat pressure, but Stroker John switched to Crane springs and titanium retainers to support the more aggressive cam test. The Crane springs have a 190-pound seat pressure. The Victor Jr. heads are designed for 500-plus horsepower out of the box with stock valvetrain geometry. Useful features include 5/8-inch-thick deck, raised valve-cover rail (+.150-inch) and raised exhaust port location (+.130-inch). Valve angles are 20 degrees. The heads were matched to an Edelbrock Super Victor intake manifold that modified with a Nitrous Express direct-port nozzle system. More details on this work by BEP Performance can be found in this early story link. To see how the intake/head combo would flow compared to numbers provided by Edelbrock for the head alone, EngineLabs called on the Power Automedia shop manager Sean Goude to hook the combination up to a Superflow SF-750 flowbench. From the results listed in an accompanying sidebar, the heads flowed according to Edelbrock’s claims. 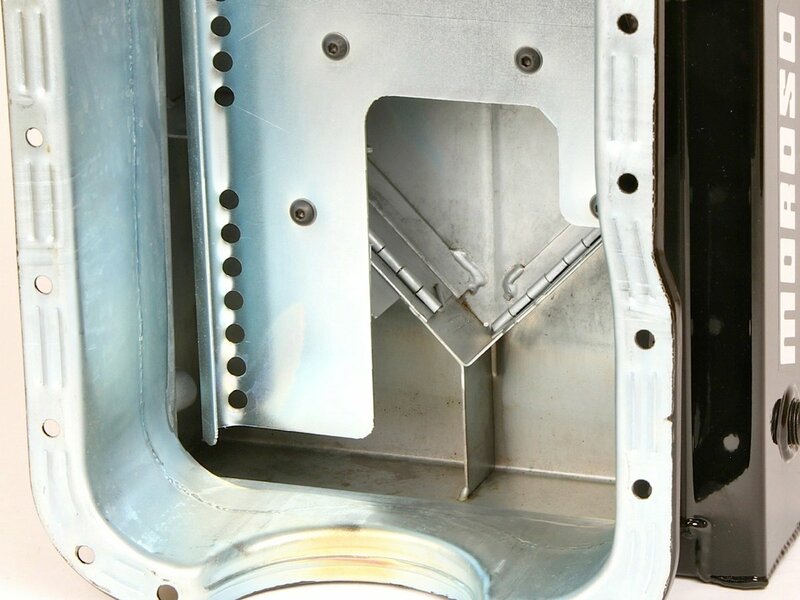 The improvement in the low-lift tests are due to the intake manifold straightening out the air for the cleaner entry and more velocity entering the port. As the valve lift increases and more air flows, the numbers tend to even out. 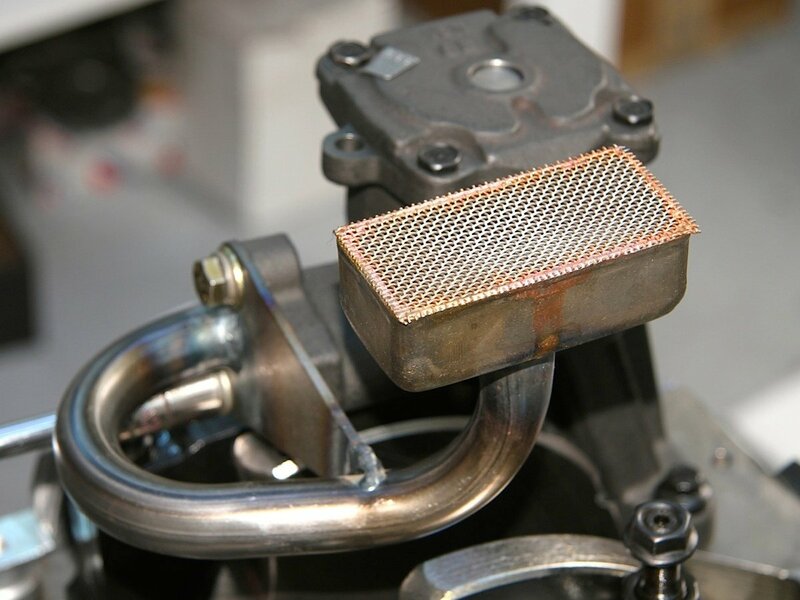 The intake-to-exhaust ratio hung around the 70-percent mark, which is good for the street. The ideal number is often posed at 80 percent, but that takes a considerable amount of exhaust port shaping and sizing to achieve such a ratio. “We feel the parts for this build are a good fit for this size engine and the performance looks great,” says Smitty Smith of Edelbrock. “The rpm range of these items on a 428 stroker should be 3,500 to 7,500 rpm. 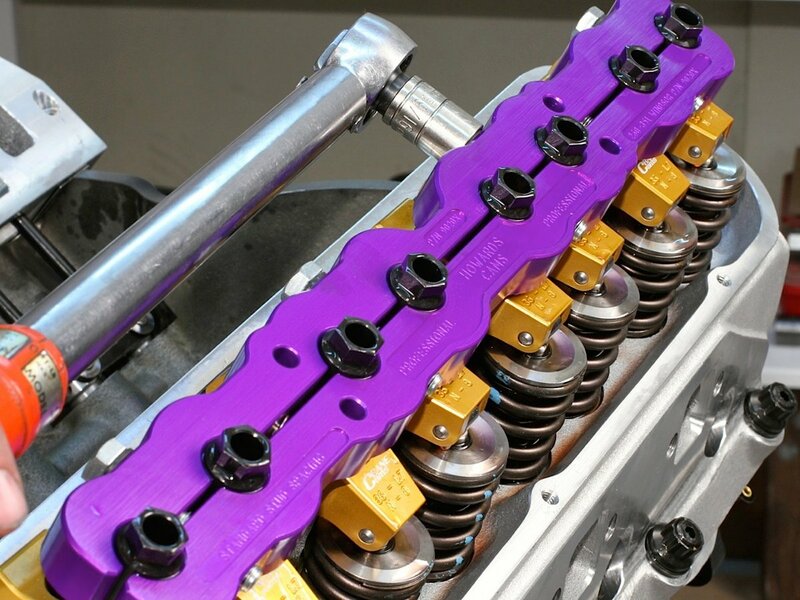 The Edelbrock heads are positioned over the studs and tightened down to 100 ft-lb. 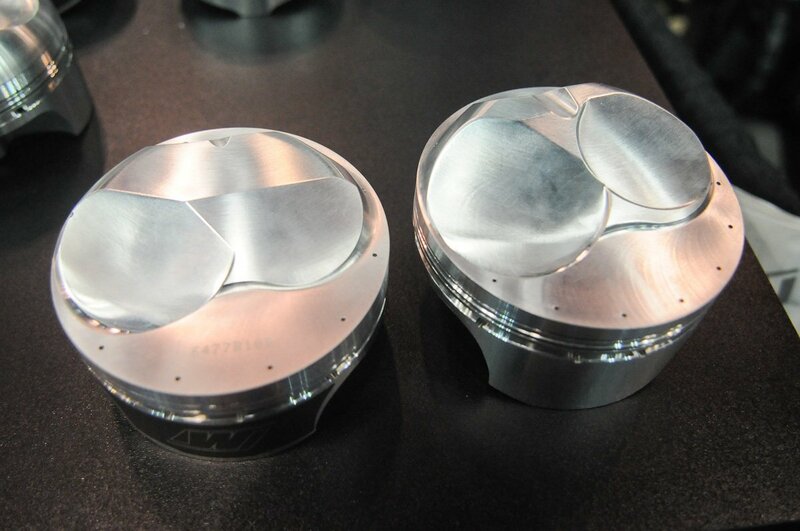 The Victor Jr. heads come with valve springs rated at 145-pound seat, 380-pound open. 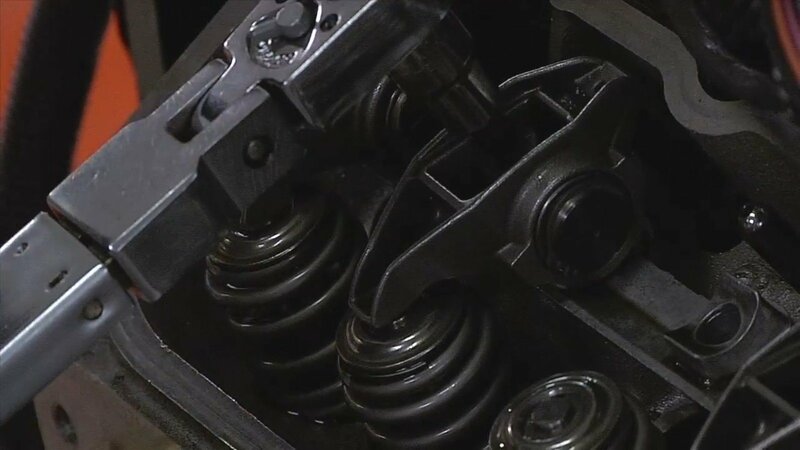 Crane suggested switching to its stiffer spring for the big-cam test, so springs with a 190-pound seat and 552-pound open rating were installed along with Crane’s Posi-stop titanium retainers with a 7-degree taper. 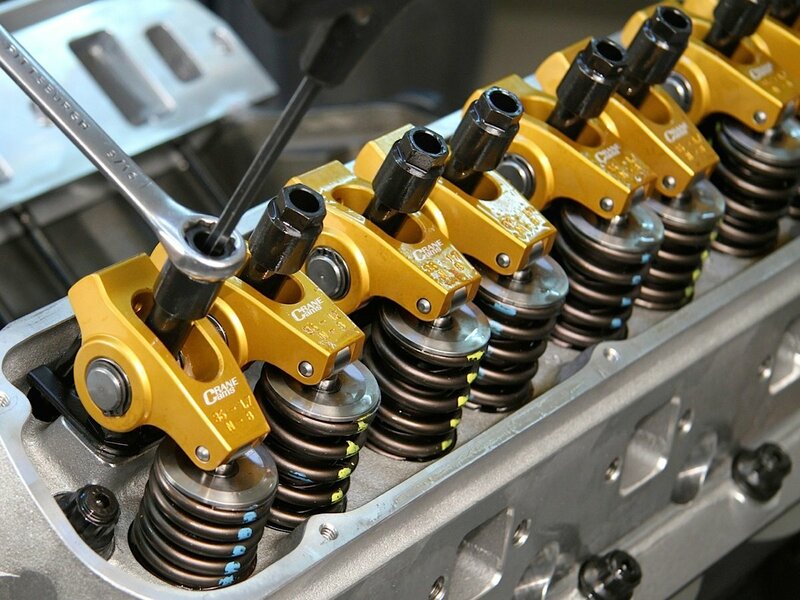 Completing the valvetrain are Crane hydraulic roller lifters, pushrods and rocker arms. The .874-inch diameter lifters feature vertical locking-bar design for easy drop-in installation. They’re machined from 8620 billet steel and heat treated. 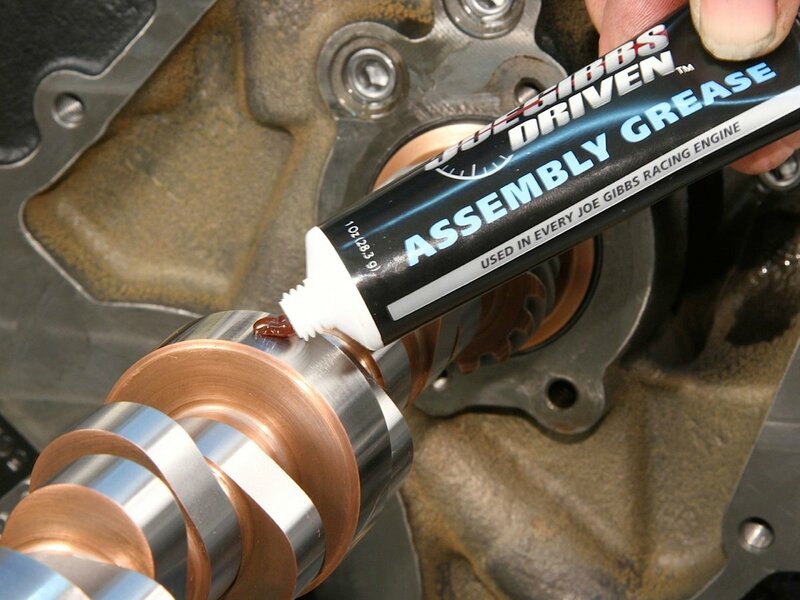 The plunger assembly are precision fit to provide proper bleed-down rates, which allows for higher rpm use when the engine properly prepared. 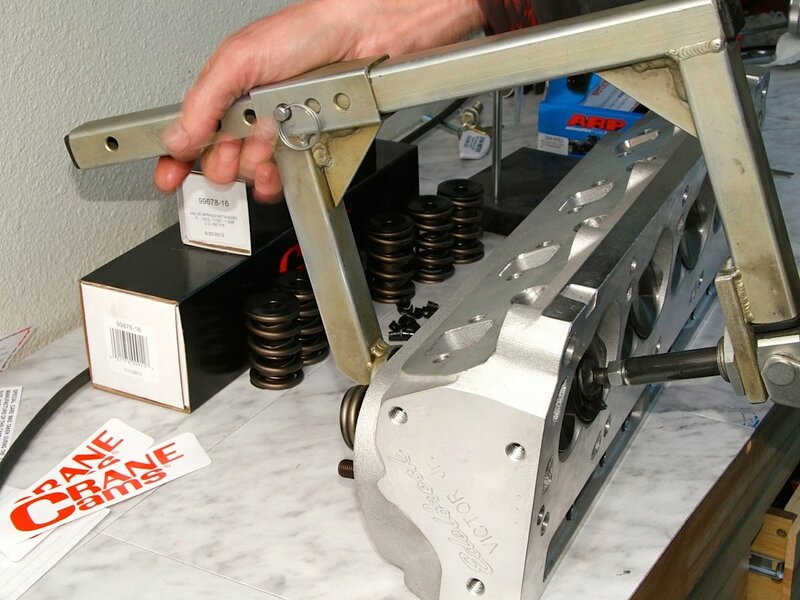 The Crane hydraulic roller lifters and 1.7:1 rocker arms are installed followed by the Howards Cam stud girdle. Crane suggests a full turn when setting the rockers. The Pro Series 5/16-inch 1-piece pushrods are cold forged from .080 wall, 4130 chromoly steel tubing and come with 5/16-inch ball ends. 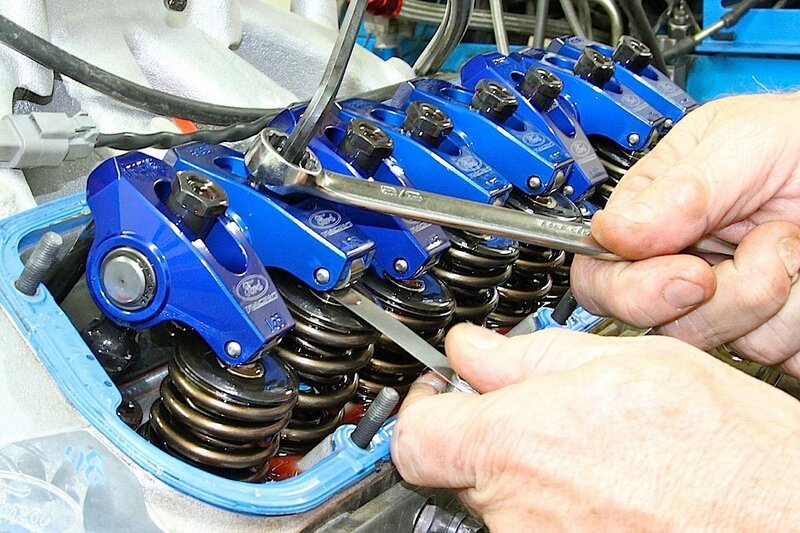 Stroker John determined that 428PJ needed 7.700-inch long pushrods to achieve the correct geometry when teamed with the Gold-Race aluminum rockers. They are CNC machined from extruded billet and feature steel needle bearings and heat-treated steel roller tips. The rockers are rated for valve springs up to 700-pounds pressure open. Helping keep the rockers in line is a stud girdle from Howard’s Cams. They’re built from billet aluminum, come with the required locking hex adjusters and are spring loaded for easy removal. 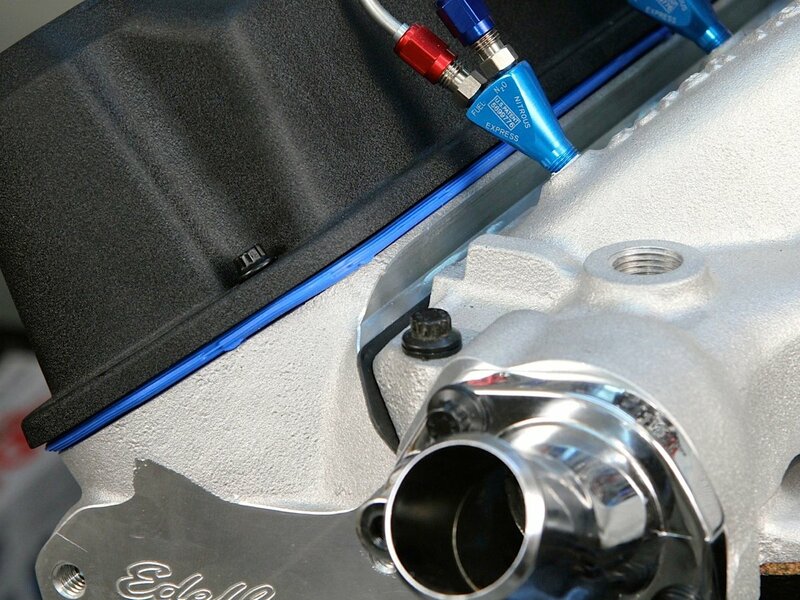 The induction system is anchored by an Edelbrock Super Victory single-plane intake that has been plumbed with a Nitrous Express direct-port nozzle system. Black crinkle Ford Racing valve covers from ProForm complement the black engine theme. The breathers are also from ProForm. The engine was preassembled to determine the correct pushrod length before the Crane pushrods were ordered and final assembly carried out. Note the Fel Pro intake manifold gasket and use of ARP 12-point, black-oxide bolts to button up the engine. The front end of the engine was buttoned up with an Edelbrock timing cover and water pump. The first arrangement was a traditional combination using a timing cover with a provision for a mechanical fuel pump and a standard rotation water pump. Before going to the dyno, the decision was made to switch from a V-belt accessory drive to a more reliable Concept One serpentine system. That meant swapping to a reverse-rotation water pump, which required a later-model timing cover that doesn’t have a fuel-pump provision. 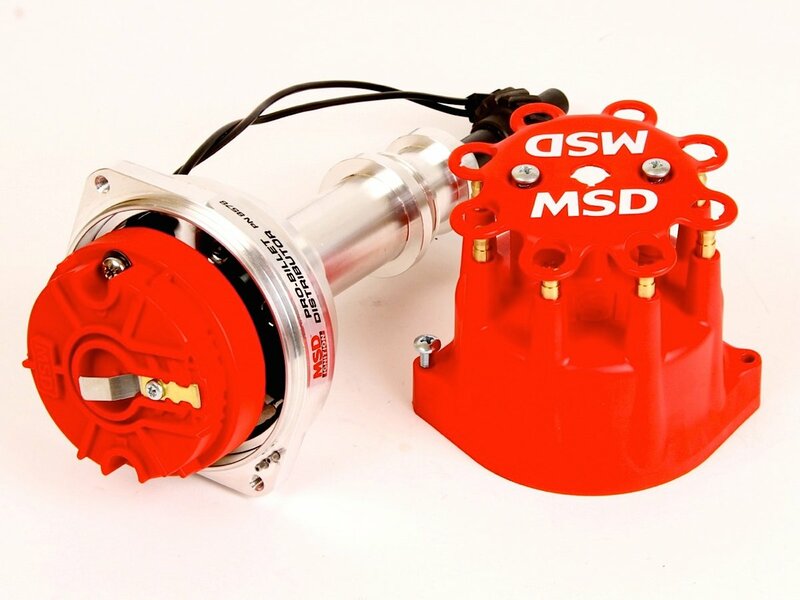 Ignition is handled with a MSD Pro Billet mechanical-advance distributor. It features a housing diameter smaller than stock and a magnetic pickup with a reluctor to deliver the trigger signals. The advance can be adjusted by changing springs. 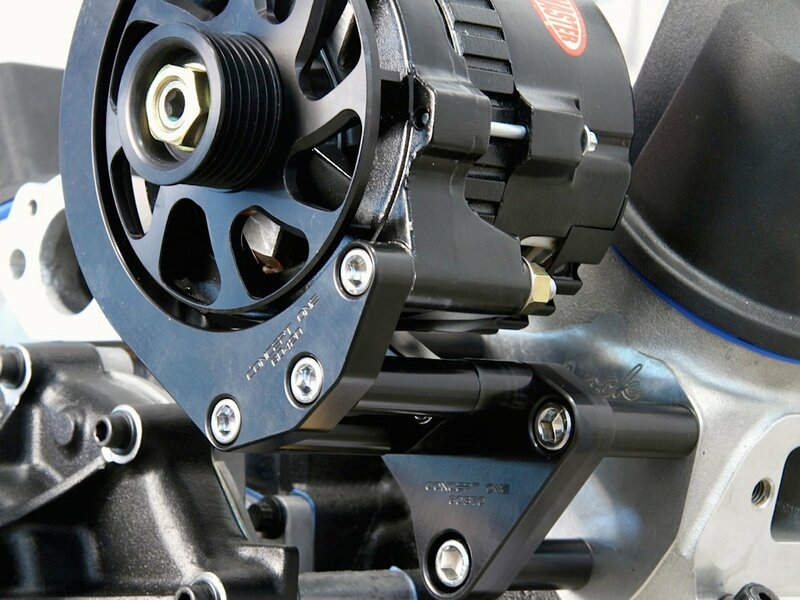 The distributor comes with a small-diameter cap and race-style rotor. The engine was first assembled with a traditional SBF timing cover, standard rotation water pump and three-hole damper with 2-o'clock timing mark. 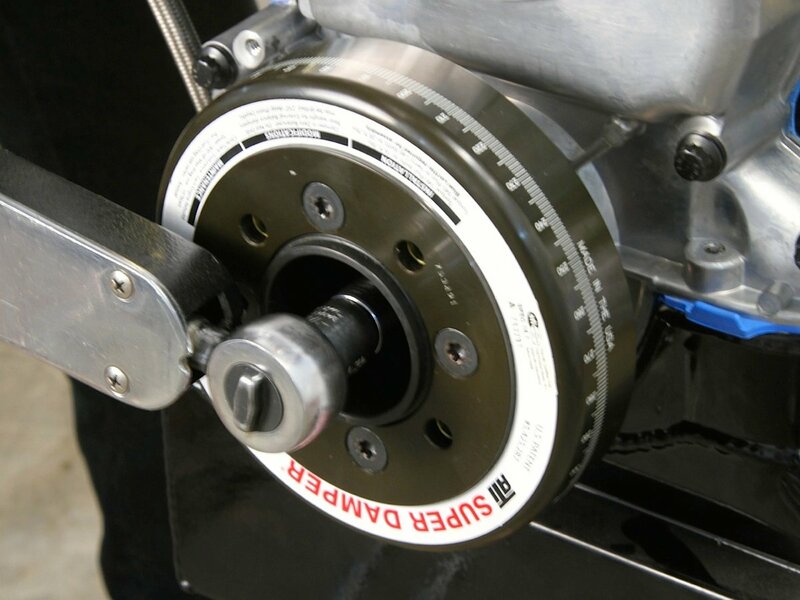 When the decision was made to add a Concept One serpentine accessory drive system was made, then the appropriate Edelbrock timing cover was swapped on to support an Edelbrock reverse rotation water pump. The change in timing cover and water pump required longer mounting bolts, so a quick trip to the fastener supply store found the correct length allen-head bolts. The proper 12-point black oxide ARP hardware will be ordered later. The engine also needed a different ATI damper with four pulley bolt holes and 11 o'clock timing marks. The damper is secured with an ARP damper bolt torqued down to 80 ft-lb. The Concept One system is a gem of stylish appearance and rugged efficiency. The brackets are CNC machined out of billet aluminum and available black anodized, which promotes the engine’s color theme. The kit is complete with pulleys, black-anodized spacers and chromed socket-head hardware. It also comes with a matching Powermaster alternator and fan, Goodyear Gatorback belt and OEM spring tensioner. Installation was quick and easy — a claim that likely could not be made if the parts were sourced from a salvage yard. All the pulleys lined up, and video from the dyno tests showed the belt worked perfectly. Concept One offers a variety of kits in different finishes and to support different accessory arrangements. With Fords, there’s also the issue of long and short water pumps. 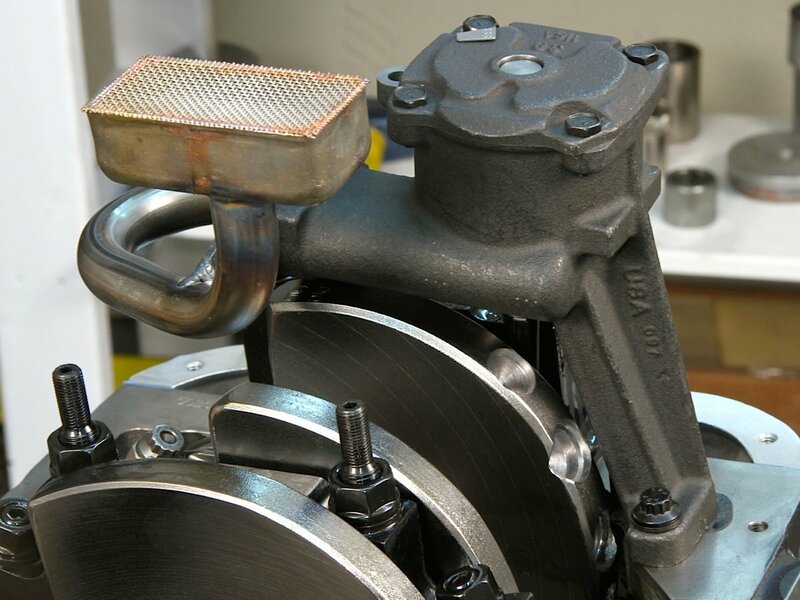 The company provides precise drawings with measurements to help engine builders select the right components, and there are also numerous options for those applications requiring A/C compressor and power-steering pumps. The Concept One pulley system features pulleys and billet aluminum brackets anodized in black. This is the simplest setup with just a water pump and alternator, but Concept One also has kits that include power steering pumps and A/C compressor mounts. The kit is complete with hardware, tensioner, matching alternator fan and Goodyear serpentine belt. Front-end assembly started with mounting the crank and water pump pulleys, then the brackets to mount the Powermaster alternator. Switching to the serpentine system also required a change of ATI dampers. The first unit had 3-bolt pulley mounting and 2-o’clock timing marks to coincide with the water pump’s traditional right-side inlet. The reverse-rotation pump has left-side inlet, which puts the timing marks in either the 10- or 11-o’clock position. Also, the Concept One pulley requires a 4-bolt pulley. Here’s the completed engine with the tensioner installed and the belt properly routed. Note the Moroso flexible dipstick. The first dyno test will also feature a Quick Fuel race-prepped 1,000 cfm carburetor. The ATI Super Damper for 428PJ features a 3-piece shell assembly with a 6.325-inch diameter outer shell, an inertia weight and an inner shell. This assembly is bolted to the crankshaft hub. The dampening dynamics come from a number of rubber-like elastomer O-rings between the hub and inertia ring. These O-rings are tuned to a specific frequency through either different diameters or materials. 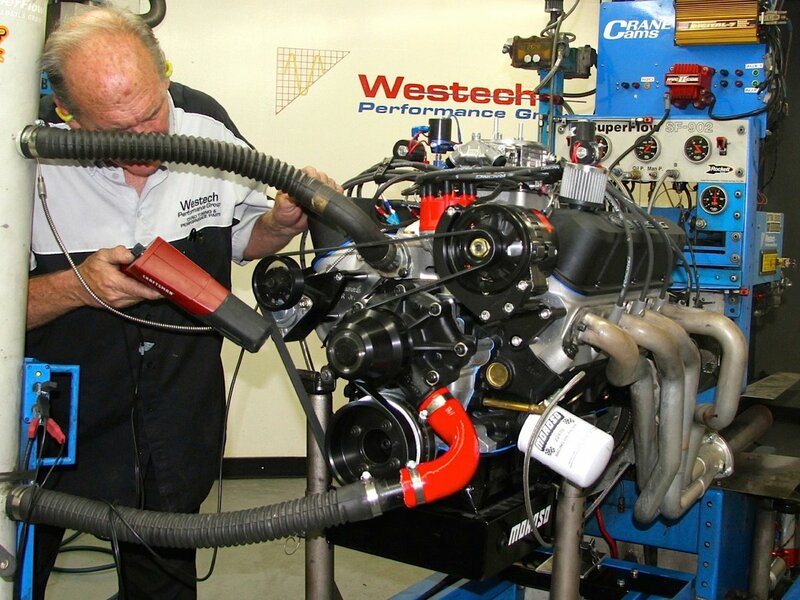 The engine was transported from Stroker John’s facility in Apple Valley, California, to Westech Performance in nearby Mira Loma. There it was hooked up a SuperFlow SF-902 dyno. 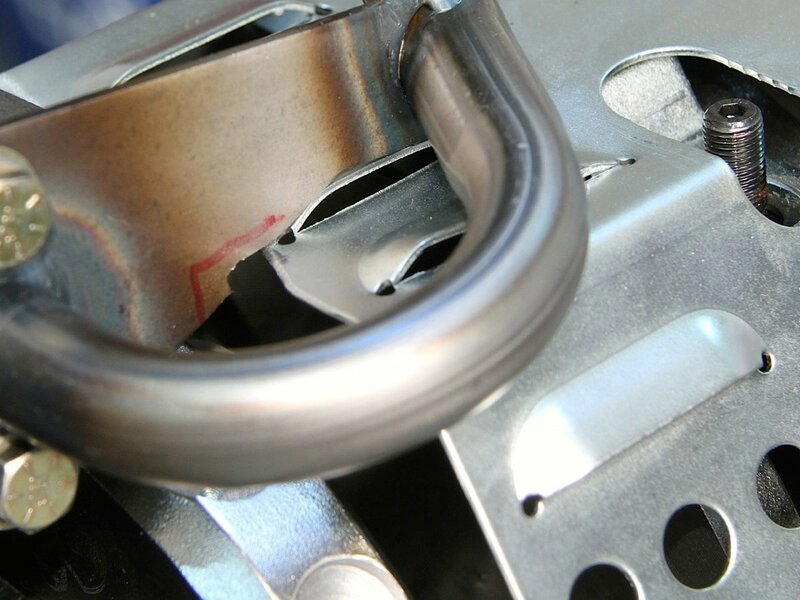 Unlike OEM dampers that bond the elastomer rings to the hub, ATI dampers feature computer-machined grooves to support the O-rings, thereby allowing for the dampers to be rebuilt. The ATI Super Damper for 428PJ is also constructed and tuned to match the engine’s internal balance. Before the initial startup, the engine was treated to Driven BR30 break-in oil. Troy Goldie removed the distributor to drive the oil pump with a drill to pre lubricate the bearings. 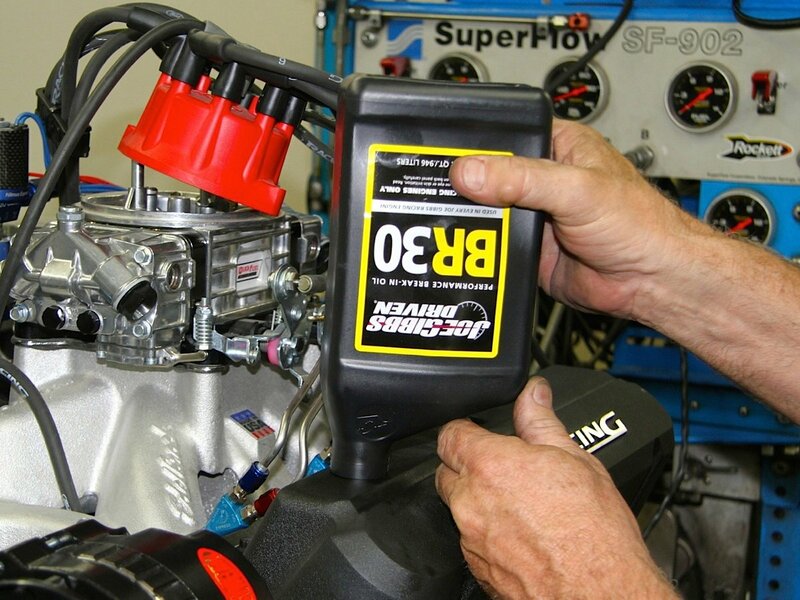 Steve Brule checked for oil flow at the rocker arms. Remember, on the Windsor the drill must rotate counterclockwise to properly drive the oil pump. Upon startup, Brule set the timing at 33 degrees, then bumped to 35 after a couple early pulls. 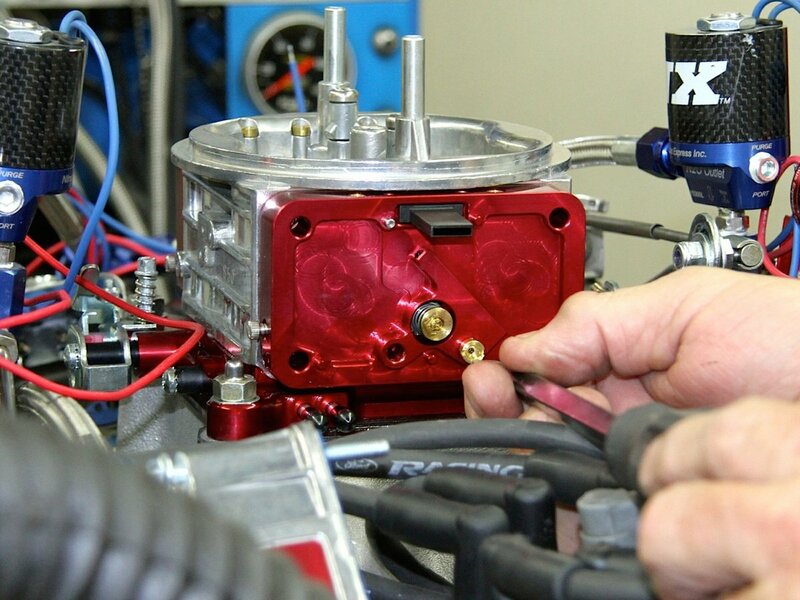 Rounding the 428 Pony Jet project is an MSD ignition system anchored by a Pro Billet distributor. The serpentine system necessitated moving the Blaster coil to the rear of the manifold, but Stroker John fabricated a nifty bracket to support the mounting. If this engine would ever be modified strictly for electronic ignition control, the timing advance can be locked out with a simple process — no need to weld the weight plate. The distributor was locked down with a MSD clamp and will be hooked up to a MSD Digital 6-plus ignition control when the engine is installed in the vehicle. 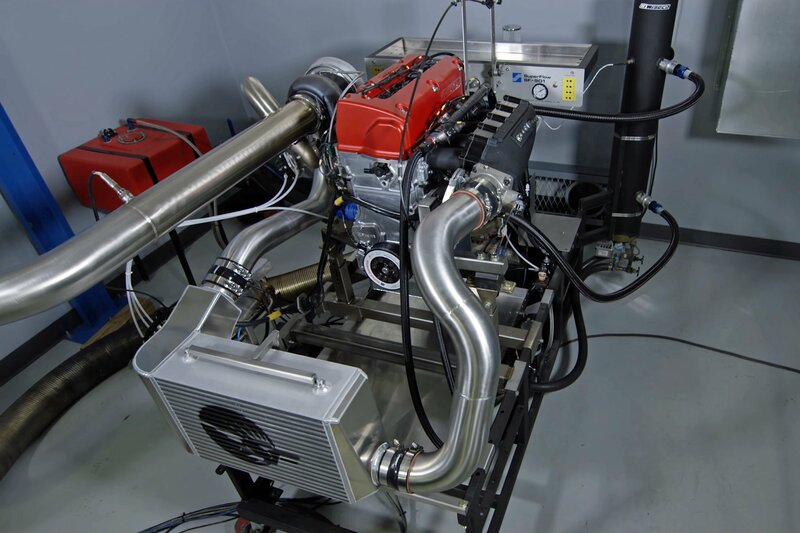 For convenience at the dyno tests, a MSD Digital-7 control was used along with a MSD HVC-2 coil — since both were already wired in with the nitrous control and dyno software. Ford Racing 9mm wires were cut to fit, and NGK spark plugs were installed. Finishing up the engine’s appearance and function needs are ProForm products that include a set of black Ford Racing valve covers, chromed breathers, chromed water neck and an adjustable timing pointer. 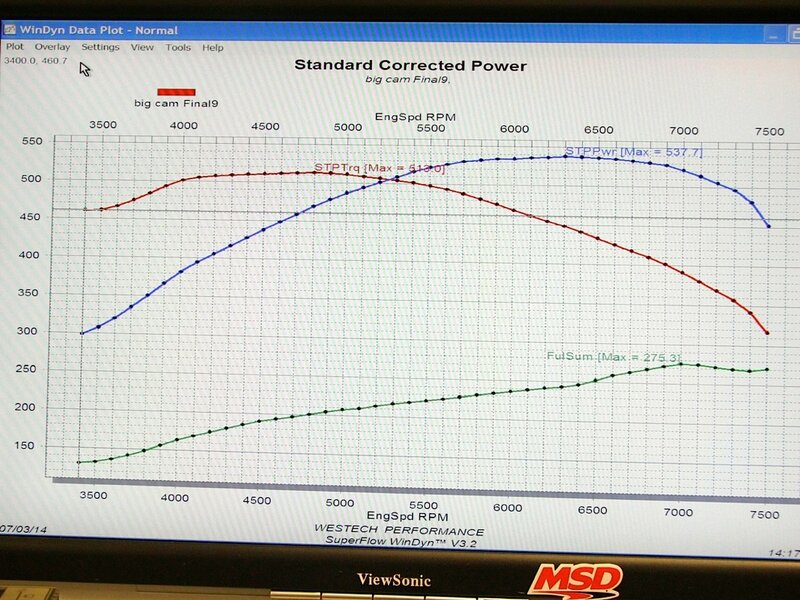 Once on the Westech SuperFlow SF902 dyno, final preparations were made, including bolting on 1 5/8-inch dyno headers. The engine was primed with Driven BR30 break-in oil and the Quick Fuel RQ-1000 carb was installed as delivered with 82 jets in the primary and 88 in the secondary. 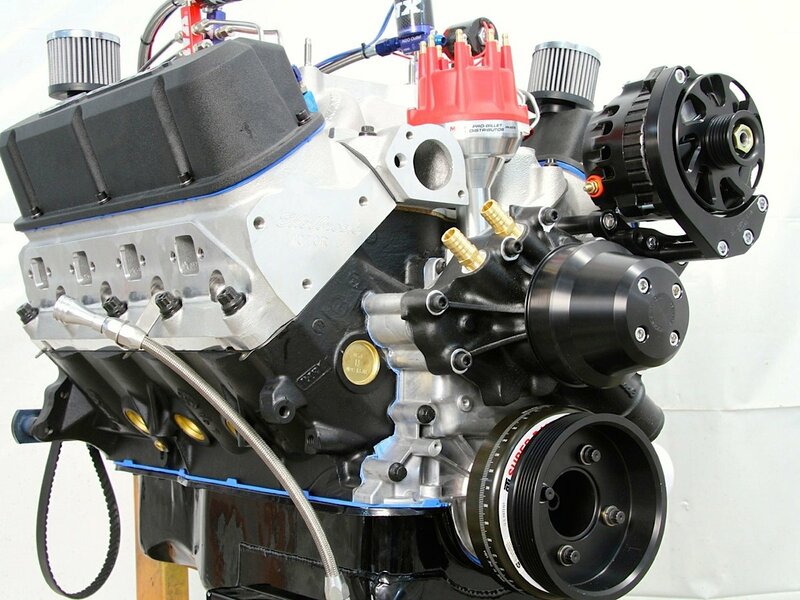 The RQ-1000 is a race-prepped 4-barrel aluminum-bodied carb that features a billet throttle body, 4-corner idle, recessed screw-in air bleeds and fully adjustable billet metering blocks. First dyno session with the big cam and carb resulted in a best of 537.7 horsepower at 6,300 rpm and peak torque of 513 lb-ft at 4,800 rpm. Note how fast power dropped off approaching 7,000 rpm. Upon initial startup, ignition time was set at 33 degrees. Break-in procedure included varying the engine speed between 2,600 and 3,100 rpm and gradually adding load to the dyno. Part of the break-in process also included easy pulls up to 4,000 and 5,000 rpm to check air-fuel ratio and oil pressure. A couple more pulls past 6,000 rpm revealed that the engine liked a couple more degrees timing, so it was set at 35 degrees total advance for pulls up to 7,500 rpm — which is usually unfamiliar territory for a street Windsor of this displacement. For the second dyno session, the smaller carb and cam were installed along with softer valve springs and the 1.6:1 rockers. The QuickFuel Q-850 carb also received a jet change after early pulls revealed a rich condition. The best dyno run with the big cam and carb resulted in 537.7 horsepower at 6,300 rpm with peak torque of 513.0 lb-ft at 4,800 rpm. The torque curve was rather flat, recording 475-plus lb-ft from 3,700 rpm up to 5,900, and there was 500-plus horsepower from 5,200 rpm to 7,200 rpm. 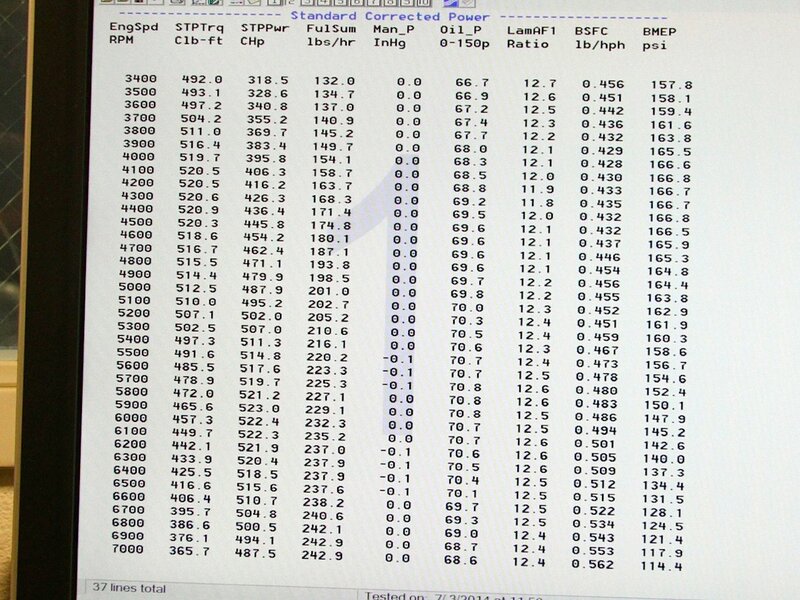 Westech manager Steve Brule notes that the average readings for 428PJ from 5,500 to 7,000 rpm were 449 lb-ft of torque and 531 horsepower. This is the preferred street setup that resulted in more torque at a lower rpm while losing only 14 horsepower — but at a lower rpm, as well. 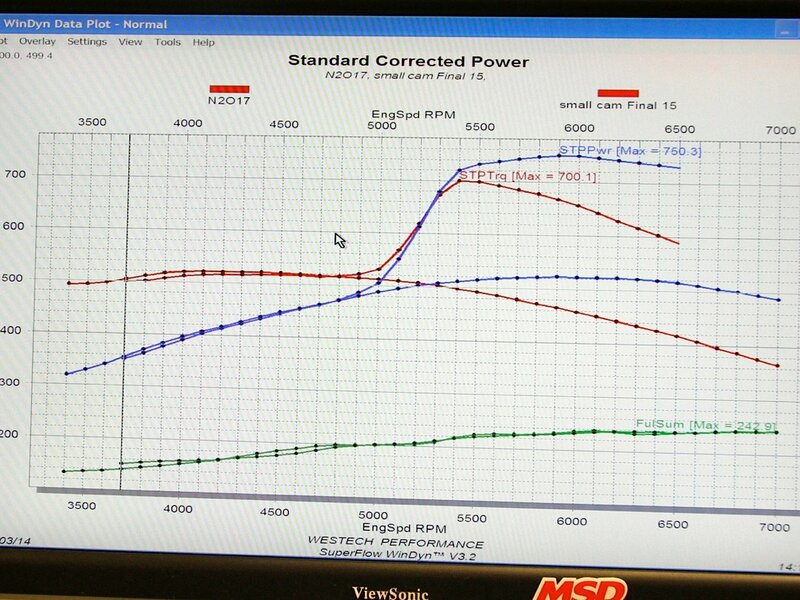 The graph is actually a blend of two dyno runs to get readings from 2,400 rpm up to 7,000 rpm. A typical dyno sweep covers about 3,000 rpm. Between the two pulls, there was a best of 523 horsepower at 5,900 rpm with peak torque of 523.9 lb-ft at 4,400 rpm. As a comparison, Brule ran the numbers from 4,900 rpm up to 6,400 rpm, which would indicate the power levels if the car was shifted at 6,400 instead of 7,000 rpm. The torque, of course, was a little better at 484 lb-ft but the horsepower dropped to 519. While the intake was off during the cam swap, Westech installed jets for a 200 shot of nitrous. Not willing to take a chance, fuel was changed to 118-octane race gas and ignition was programmed to retard eight degrees when the nitrous came on. The nitrous button was hit at 5,000 rpm. Peak power of 750.3 horsepower was observed at 5,900 rpm. The smaller cam and carb were swapped on along with the 1.6:1 rockers and lighter valve springs. This would be final setup for the street engine. Peak torque increased to and the torque curve shifted downward, as expected; but, surprisingly, the horsepower didn’t fall off much. In fact, two pulls were made to widen the rpm range from 2,400 to 7,000, as a normal dyno sweep can cover only about 3,000 rpm. 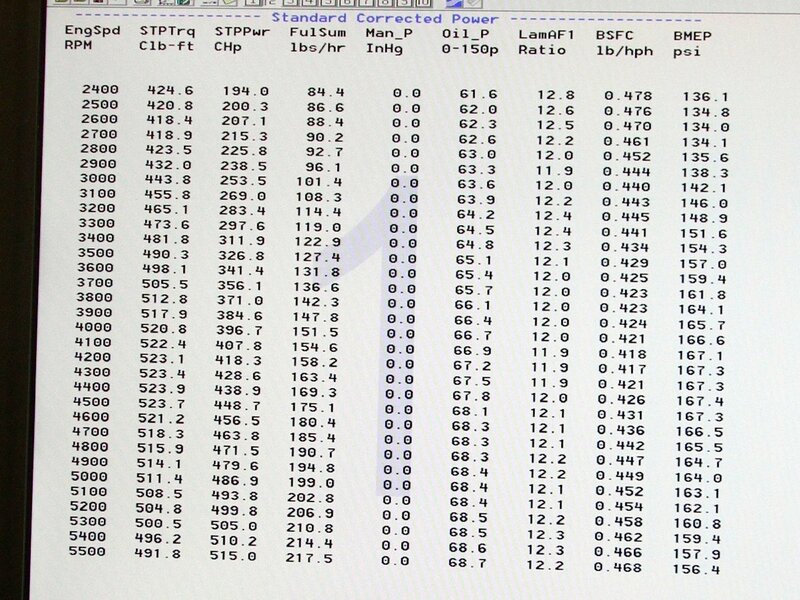 As shown in the chart, peak torque is 523.9 lb-ft at 4,400 rpm with a best of 523 horsepower at 5,900 rpm. The curve is still strong with 500-plus horsepower from 5,200 rpm up to 6,800 rpm. Would 1,000 horsepower be possible with a 400- or 500-shot of nitrous? Most likely, and it’s very reassuring to know that 428 Pony Jet is built to withstand that much juice and still have street manners. With just a little time remaining in the dyno session, the nitrous lines were hooked up and the MSD box instructed to pull eight degrees of timing when the button was hit. Also, just to be on the safe side, 118-octane gas was put in the fuel cell. The NX direct-port nozzles were fitted with jets to spray a 200-shot of nitrous, and that’s about what the engine delivered. Peak horsepower was 750.3 at 5,900 rpm with a best of 700.1 lb-ft of torque at 5,400 rpm. One more run would have been welcomed to test a 500-shot of squeeze, but time ran out. However, it’s reassuring to know that the engine’s valvetrain and rotating assembly were built to rev a little higher than the street demands and support upwards of 1,000 horsepower, if asked to deliver.